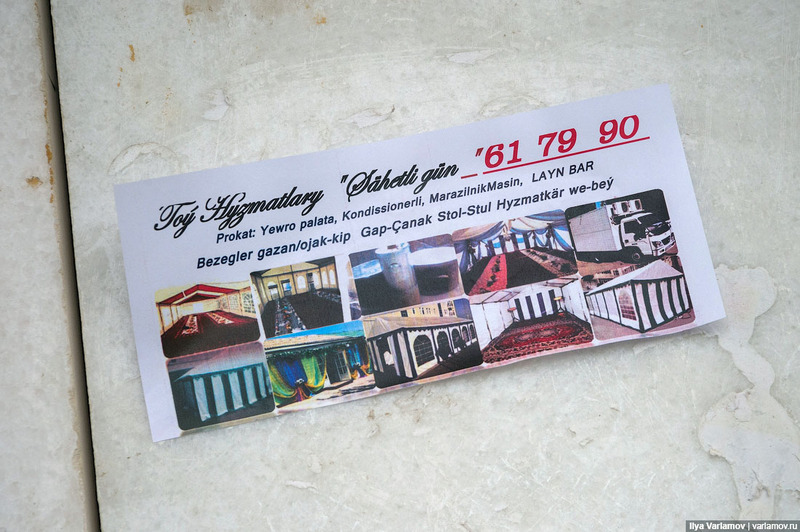 When we speak of Turkmen architecture, we can’t forget about its main architect. After all, he’s also the main doctor, inventor, rescuer, teacher, the wisest and the most generous, the master of land and sea, none other than the great Gurbanguly Mälikgulyýewiç Berdimuhamedow himself (applause, ladies and gentlemen!). 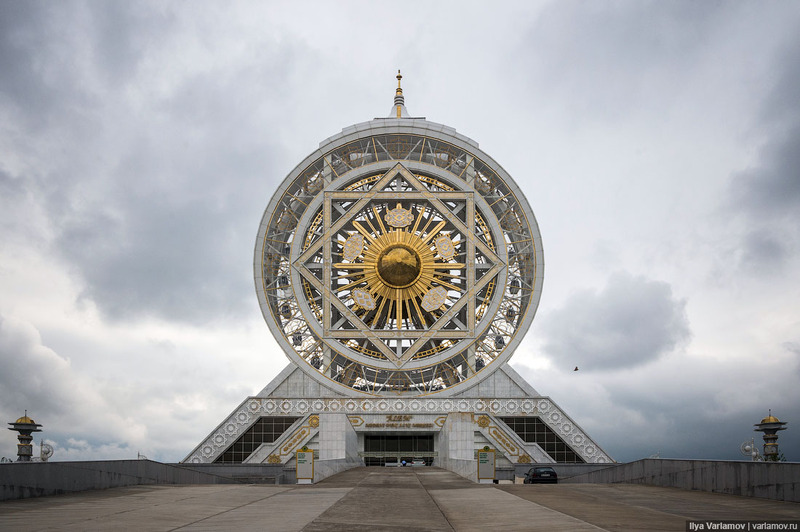 Before him the main architect was the great Turkmenbashi; that’s just how it is, and there’s no other way. 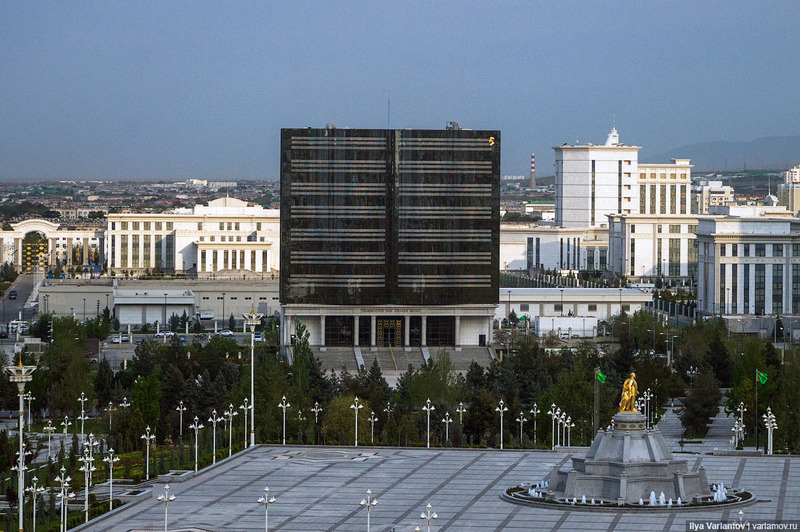 Only the tsar in Turkmenistan decides how the city looks. Architects here are never named, as the architect is secondary, and individuality in architecture is unacceptable. 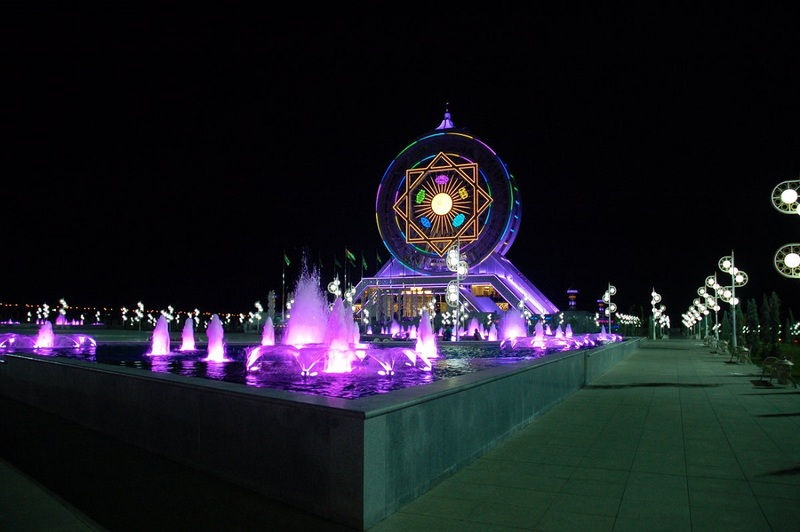 The stars of world architecture are not invited to Turkmenistan like they are to the nations of Arabs, Kazakhs, and Chinese. 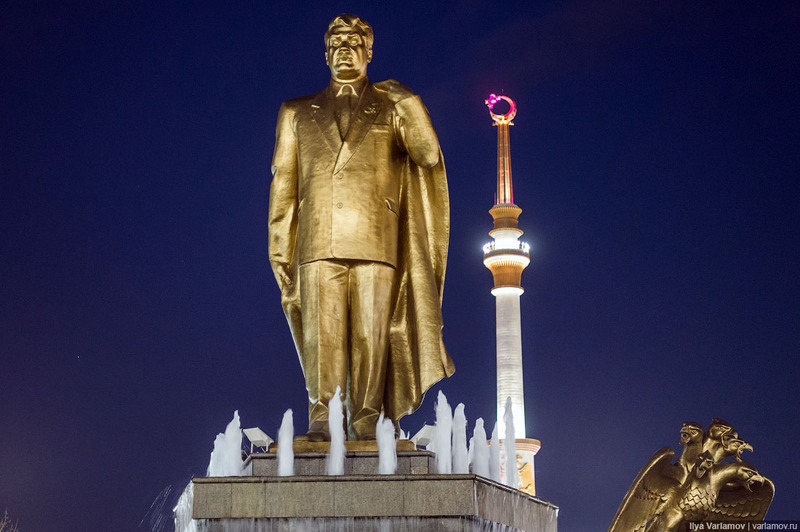 Because, of course, there can only be one star in Turkmenistan, and his name is the Sun: Berdimuhamedow, the Sun of the Turkmen people. 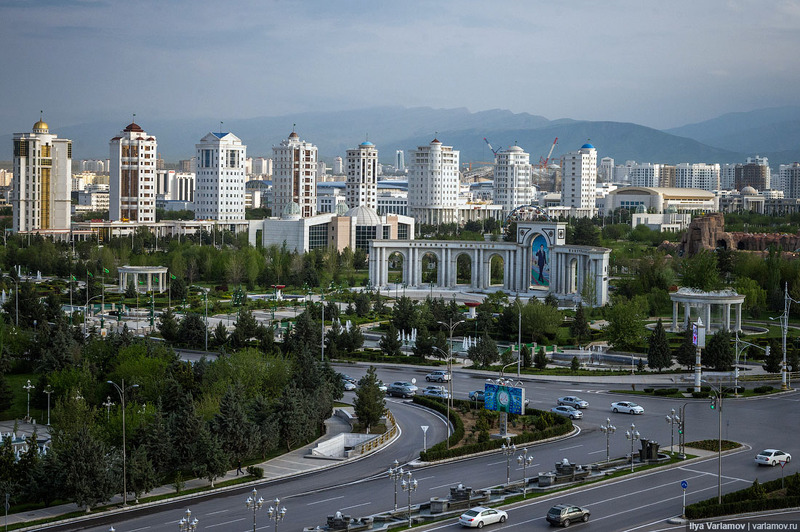 And Ashgabat is his city. The first type of building is a rather primitive form of associative architecture. A fisherman’s house would look like a fish, a coffee shop would look like a coffee mug, and this photo, for example, shows a publishing house that looks like a giant book! Very convenient. 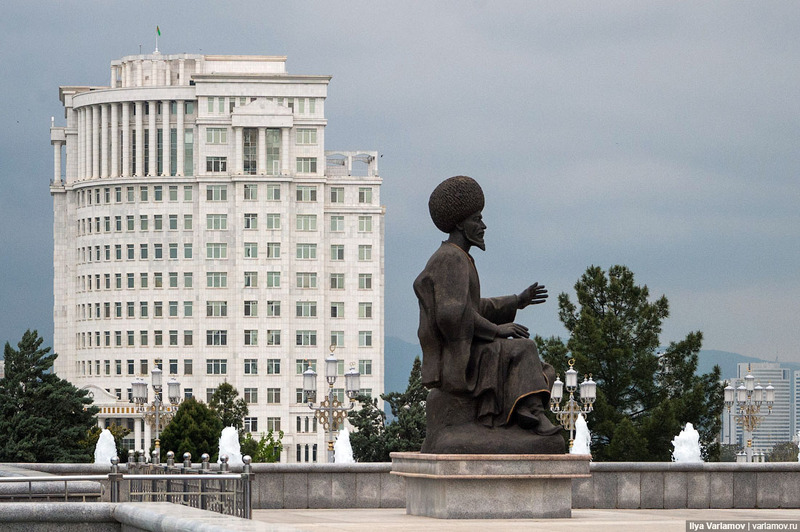 In the right corner there is a golden statue of Turkmenbashi. He particularly enjoyed such architecture. 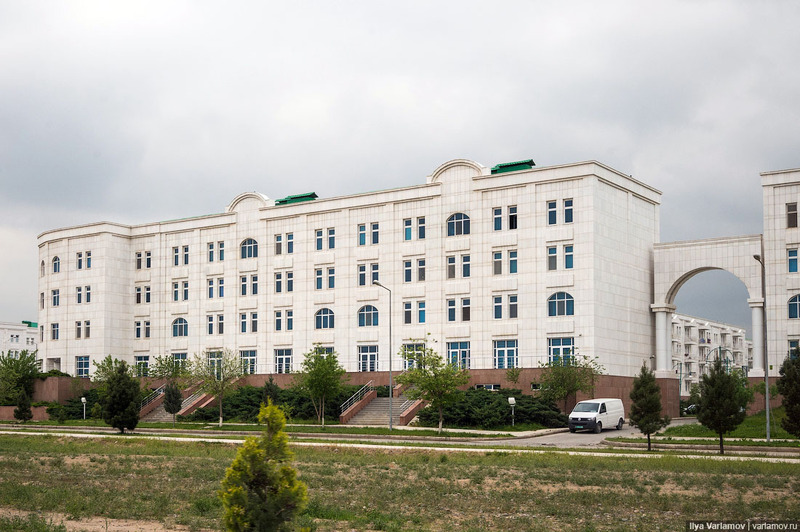 Here is a school named after the “Ruhnama”, a holy book that Turkmenbashi wrote and made all Turkmens study like a Bible. It’s also in the form of a book. 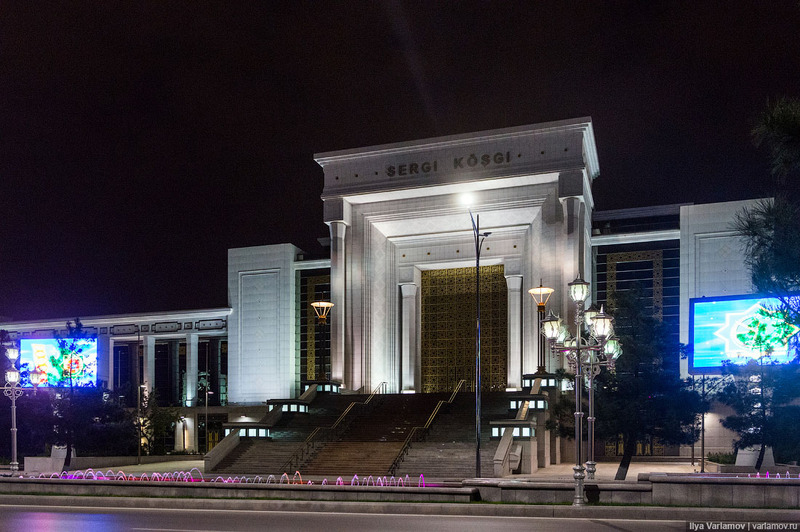 The Ruhnama is a compilation of commandments and a guide for the behavior of good law-abiding Turkmens. 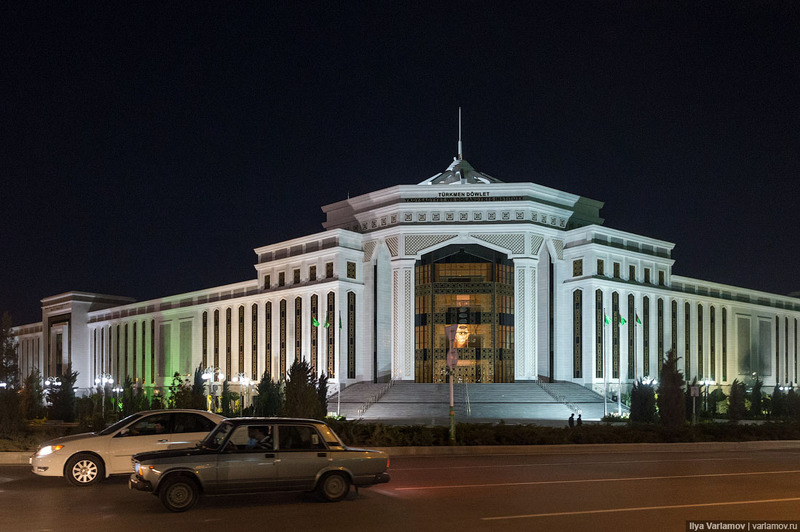 And here is the Ministry of Carpets (yep, it exists), with a rug on its facade. 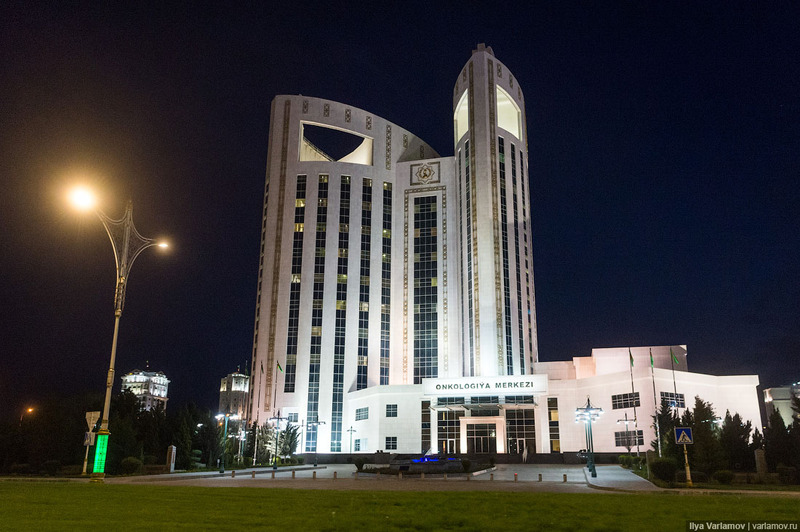 Since this is the Ministry of Health in Turkmenistan its architecture must look like a caduceus (medical symbol) with a snake wrapped around a staff. 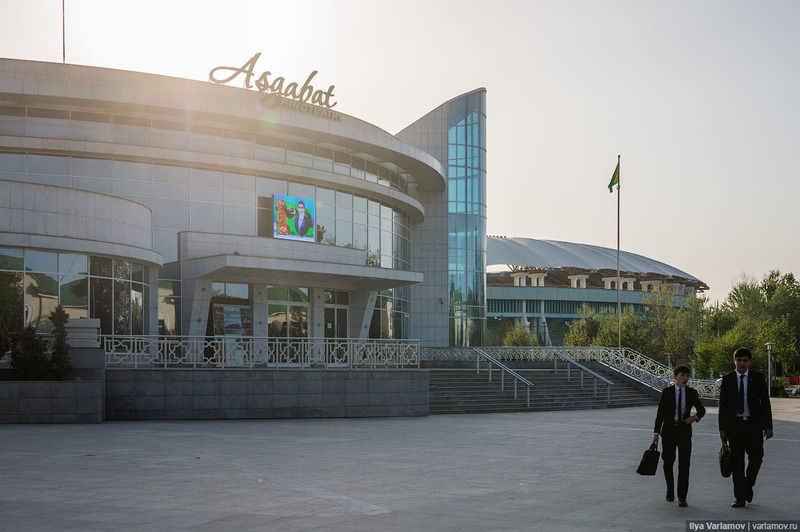 And here is the new airport in Ashgabat, which, of course, is built to look like a bird so that no one will mistake it for a train station, which of course would look like a train. 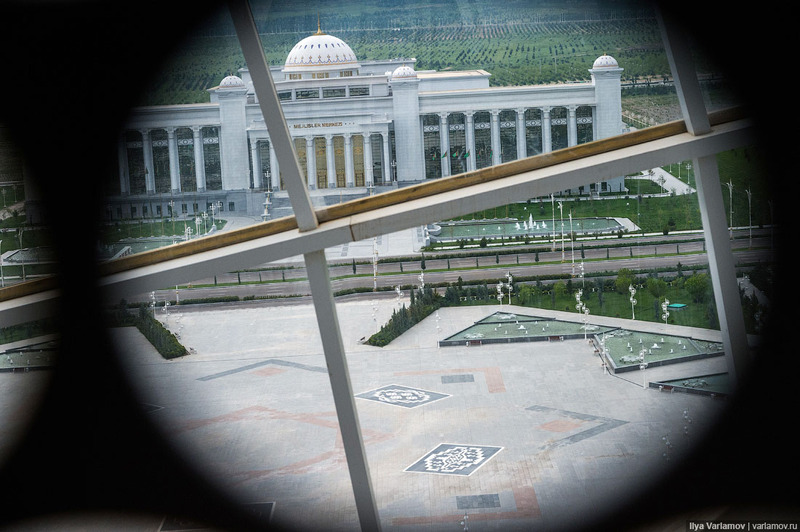 The building with the blue orb is the Ministry of Foreign Affairs. The blue orb represents the globe. 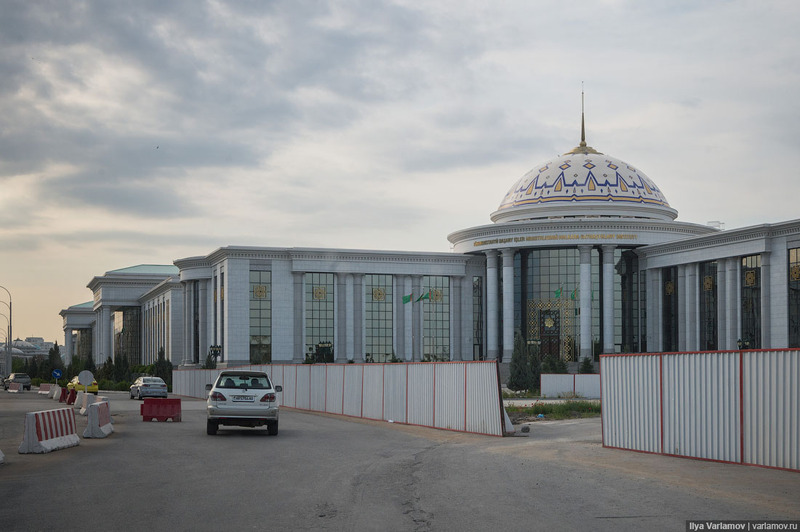 This is the central registry’s office in Turkmenistan. 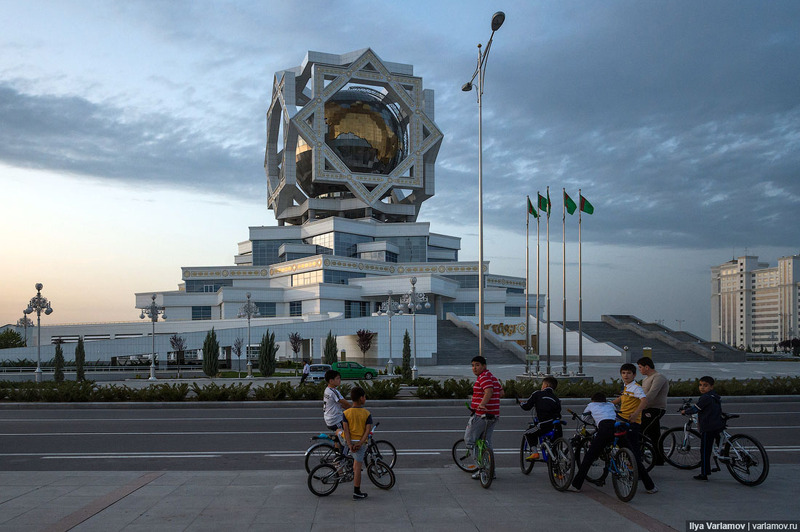 It also has a globe, as well as a gigantic octagon, the star of Oghuz Khan. 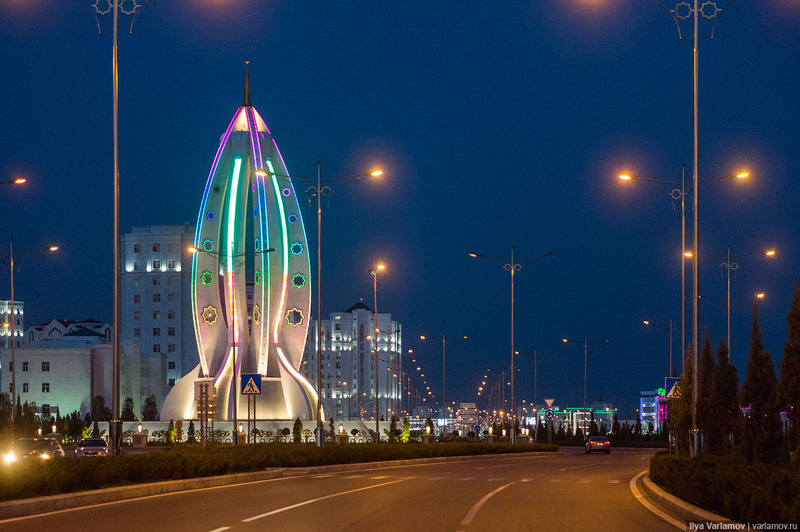 In Turkmenistan, everything possible is adorned with the star of Oghuz Khan. 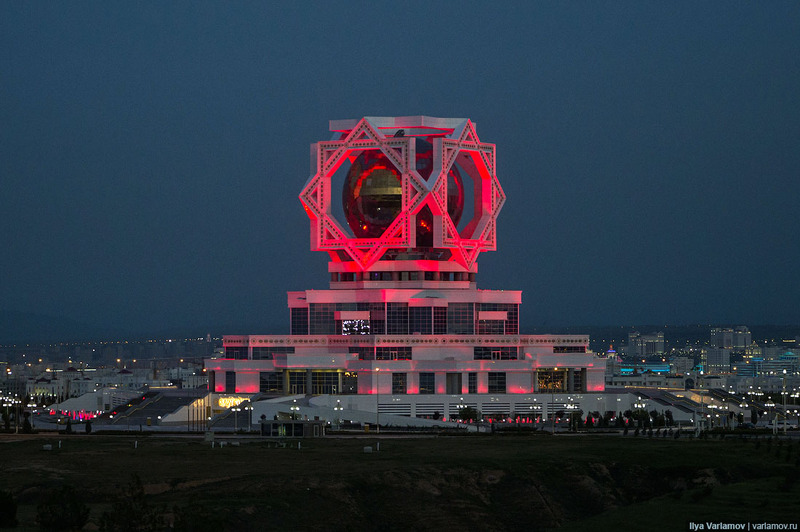 Take a look at any building; the star is everywhere. 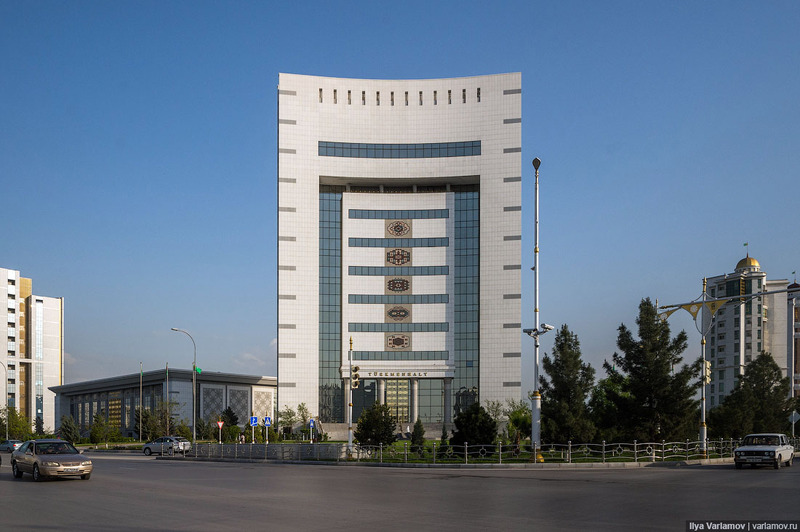 For some reason, the Ministry of Energy looks like the Leaning Tower of Pisa. 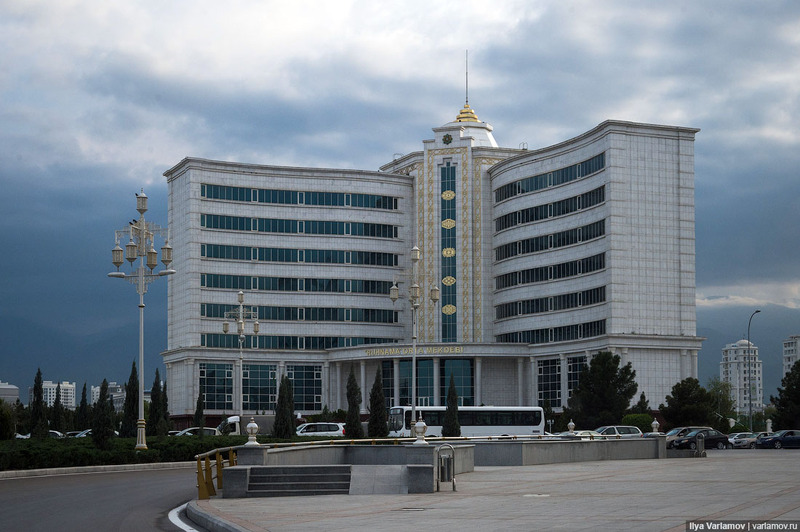 The majority of modern administrative buildings are made to resemble marble palaces. The most important thing here is the gigantic entrance with a staircase. The funny thing is, this is not actually the entrance! Well, yes, this is technically the grand entry, but no one ever uses it. 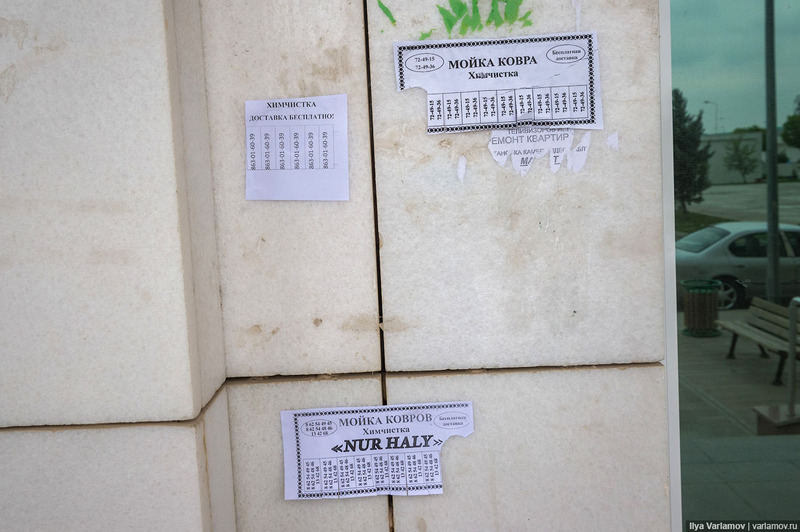 This door opens for only one person in the country: the great and wise president Berdimuhamedow. If he suddenly decides to enter some ministry or institute, he will use the wide staircase and the golden gates. 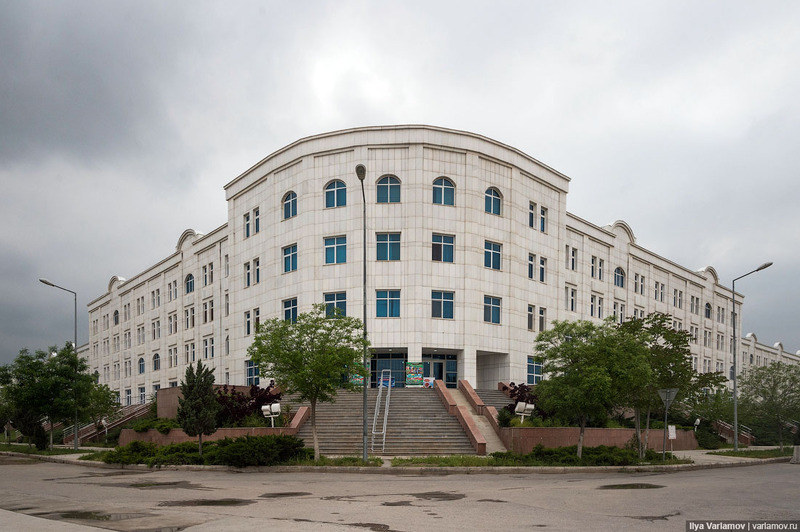 All other employees of the ministry or university use the backdoor. What is permissible for Jove is not permissible for an ox. 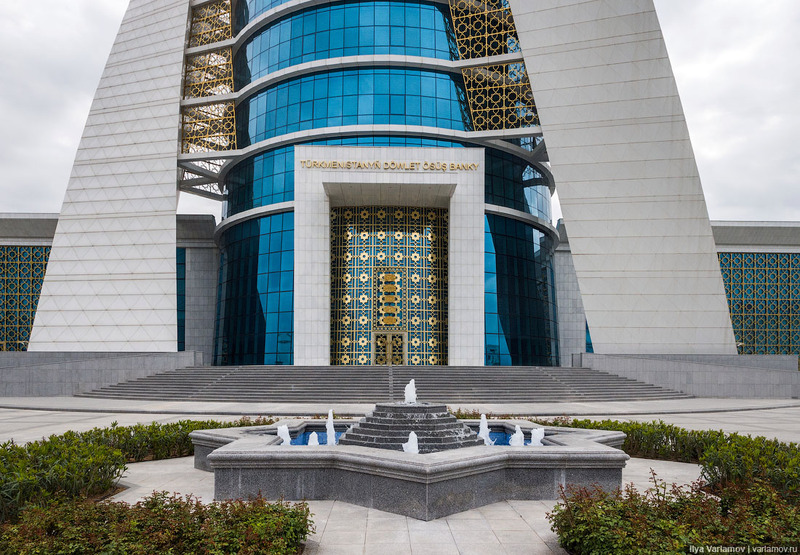 Typical Ashgabat architecture: a closed front entrance with golden doors, an octagonal star, and also, in this case, a fountain. Here we have a bank. 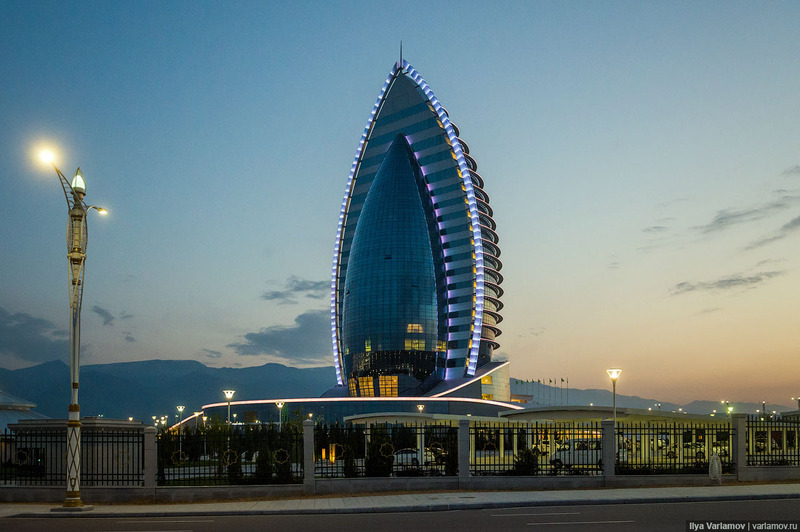 And here we have the “Yyldyz Hotel”, which is built in the form of a faceted diamond teardrop. 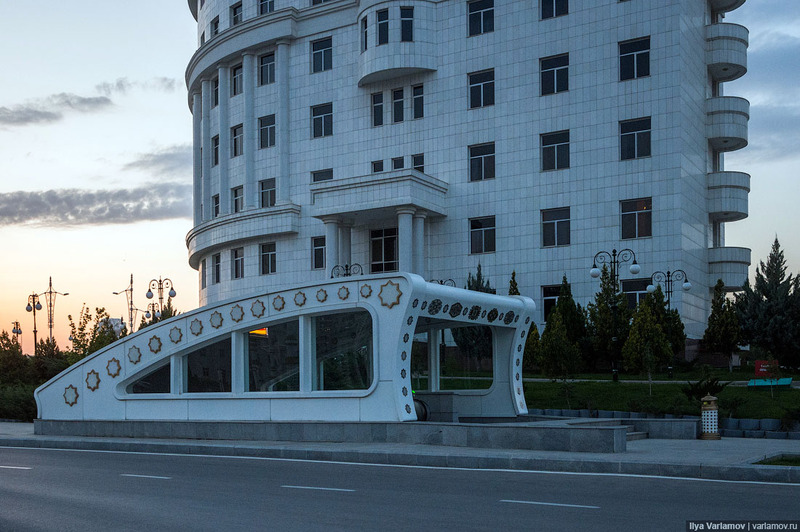 The next type of building is simply a white marble box with a golden plaque on the facade. Generally banks look like this, here the golden plaque symbolizes a gold ingot. 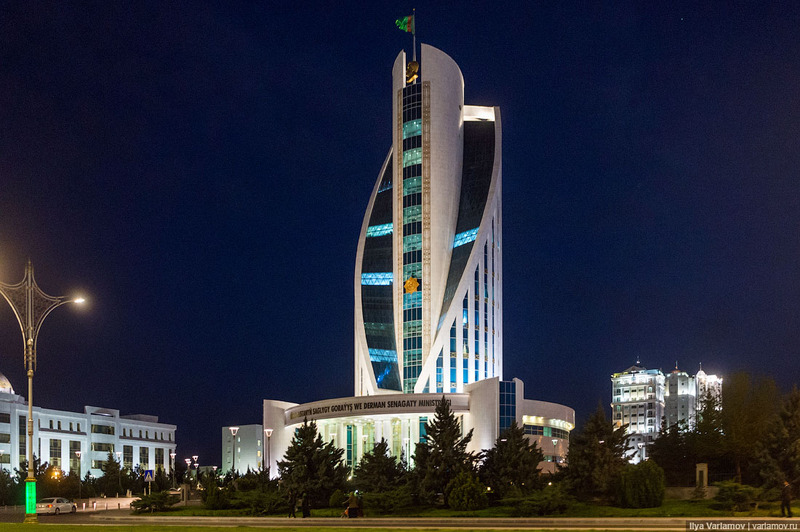 Some buildings are built in a “Sberbank” style. 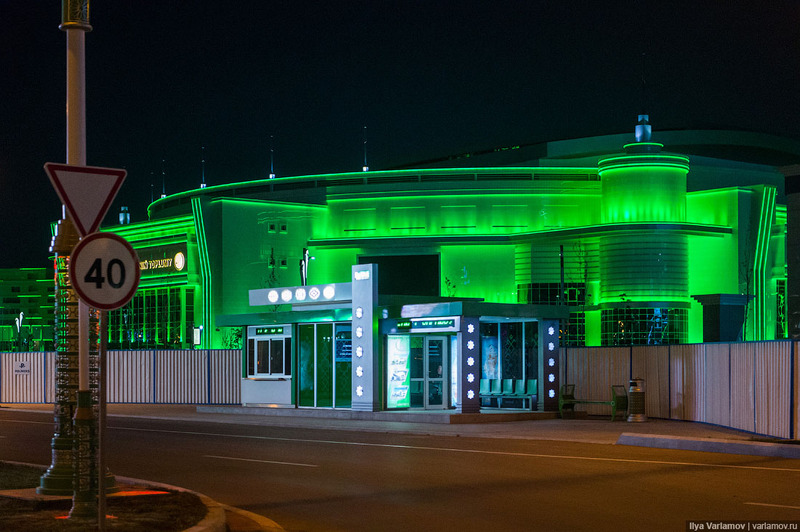 Every Russian citizen knows that the ugliest and most miserable building in any city is the central office of Sberbank. The primitive and ridiculous combination of volumes, coloured mirrored windows... all that we know too well. 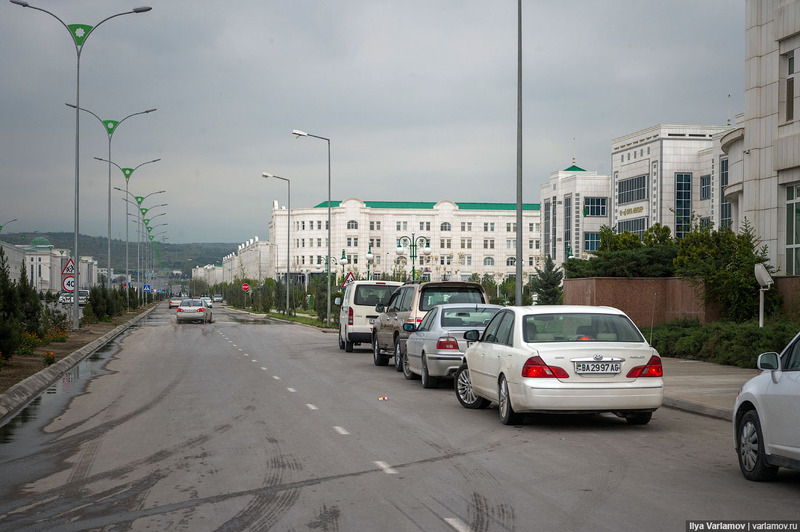 This plague has spread even to Ashgabat. 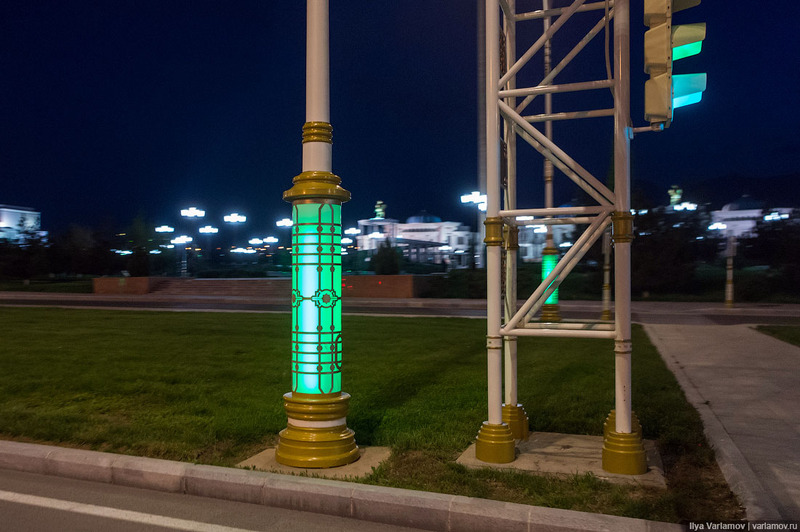 Make the lights green, and you could rent it out to Sberbank. 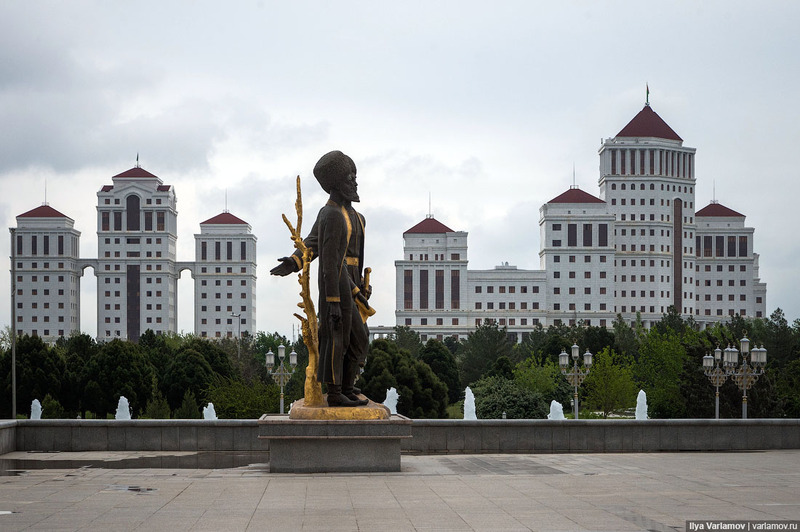 The next type of building is a domed palace. 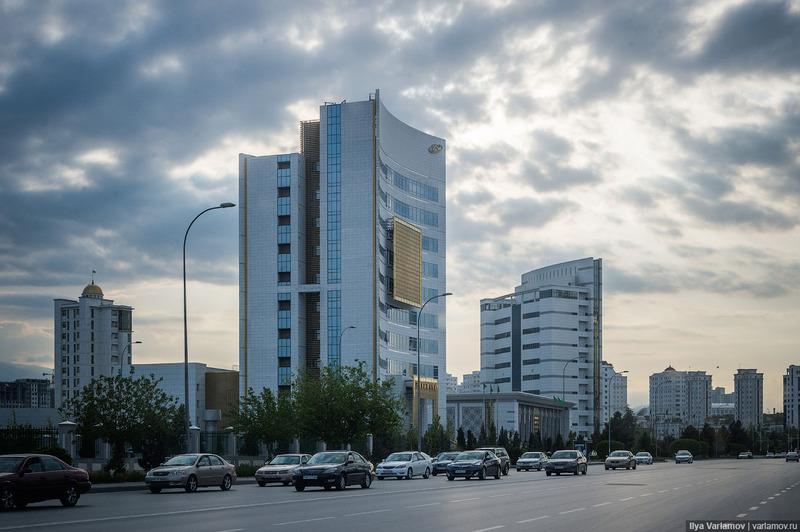 This is the trendiest style of architecture in Ashgabat. This style is now everywhere. 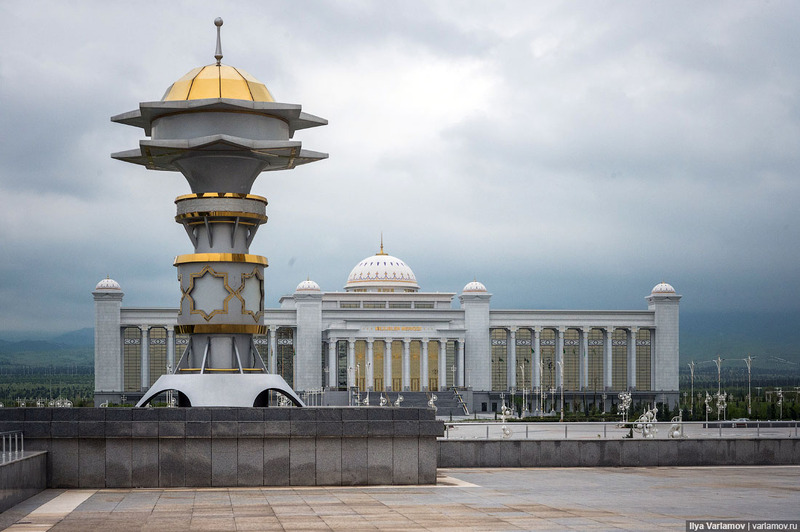 Apparently Berdimuhamedow watched Aladdin too many times and now wants every building to have a dome. Domes began popping up everywhere (even where you wouldn’t think they’d belong). 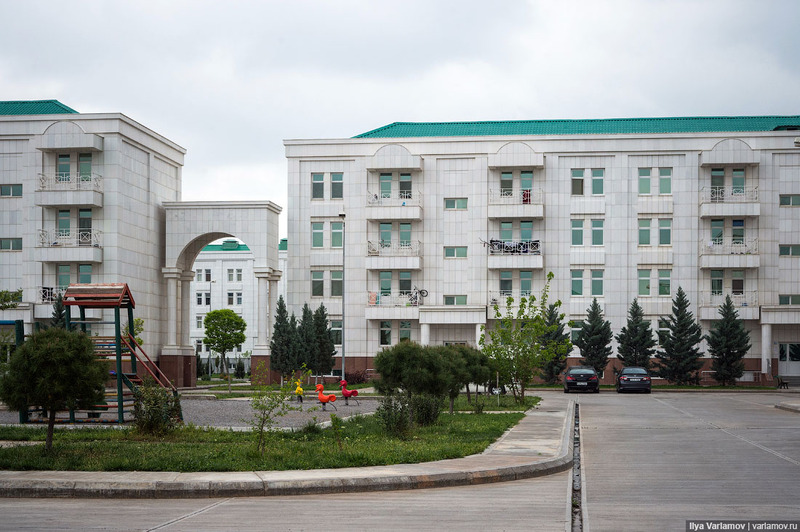 Apartment complexes cannot be built without domes. 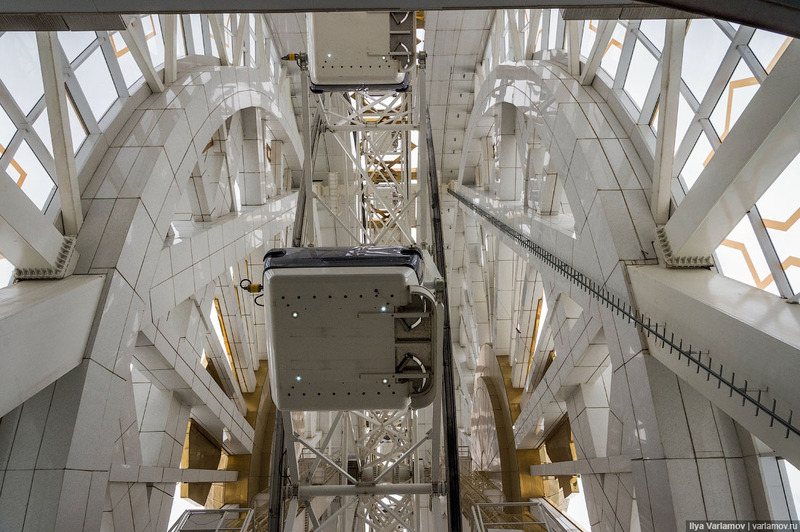 Each dome must have a flag, and each building must be slightly different from the other. This is also the leader’s desire. 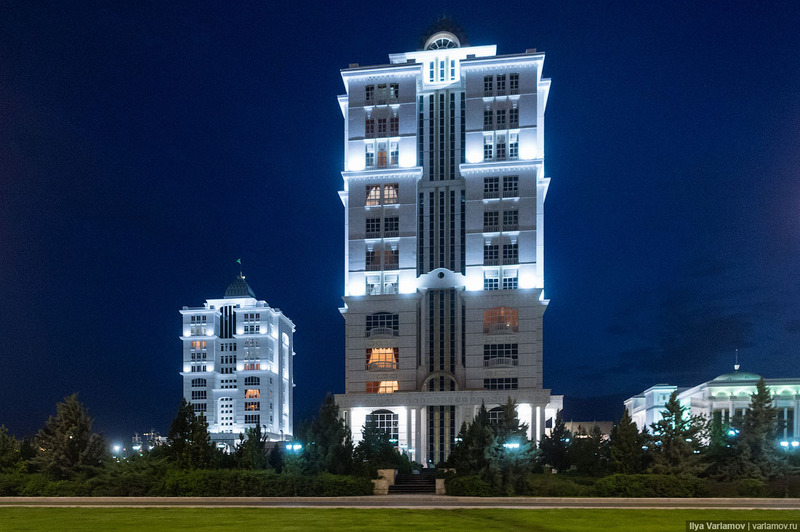 The tsar loves variety, so architects alter each building slightly. Apartments for the local elite. 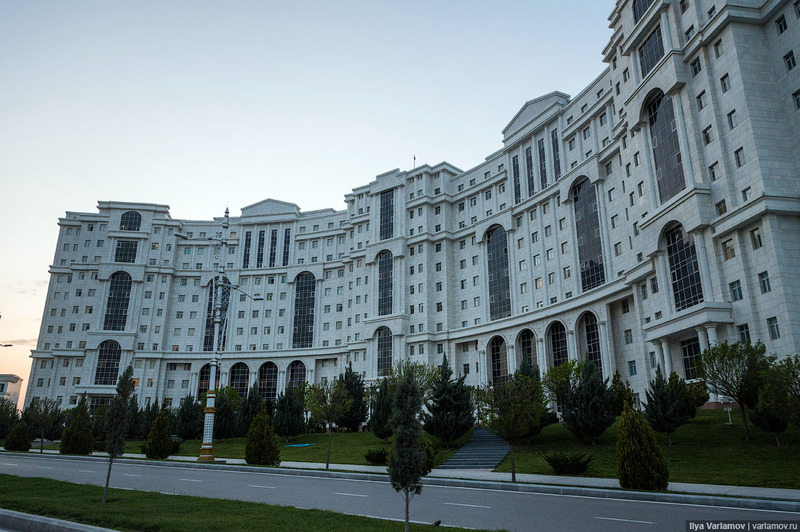 These are the apartments for some ministry officials. 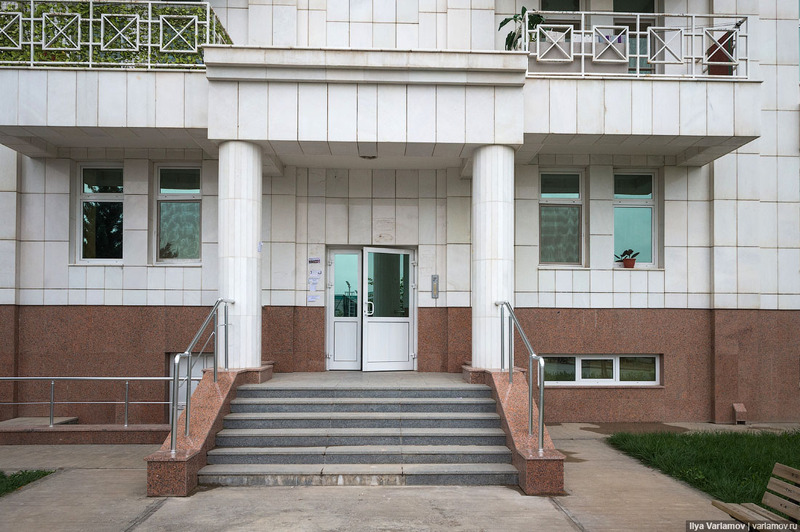 Each government organization has its own complex, just like in the USSR. They’re named after the ministries that occupy them, e.g. 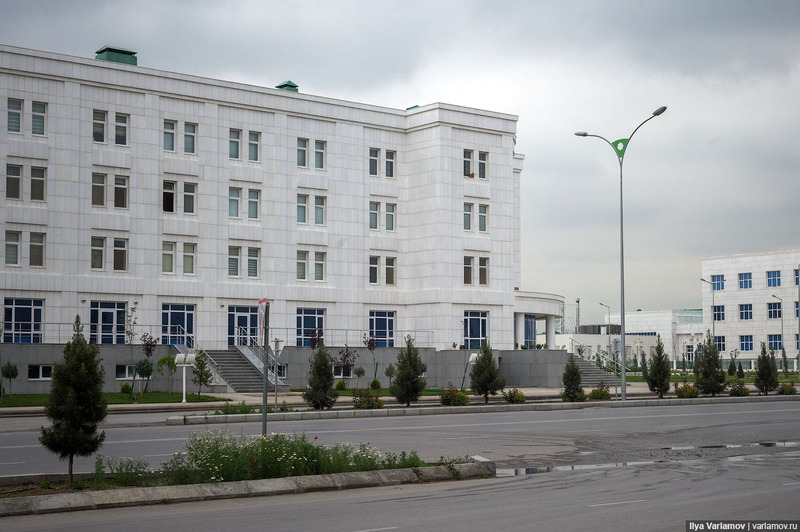 the house of the Ministry of Energy or the house of the Ministry of Education. 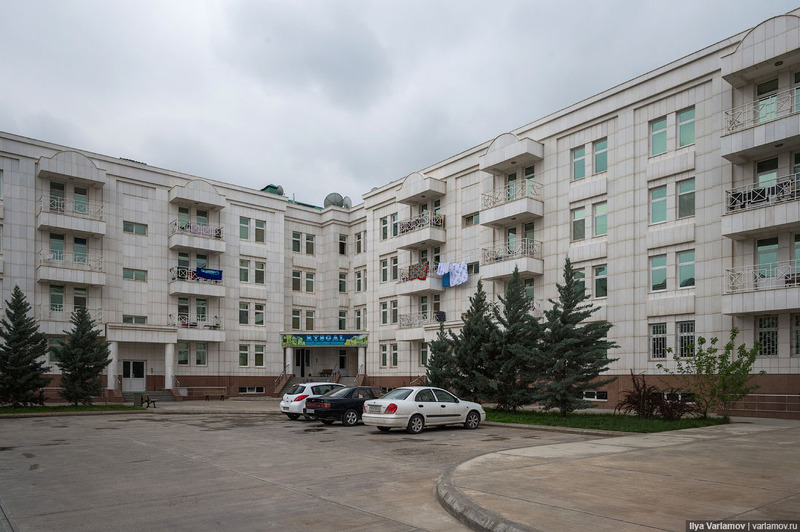 These apartments are available to government officials. 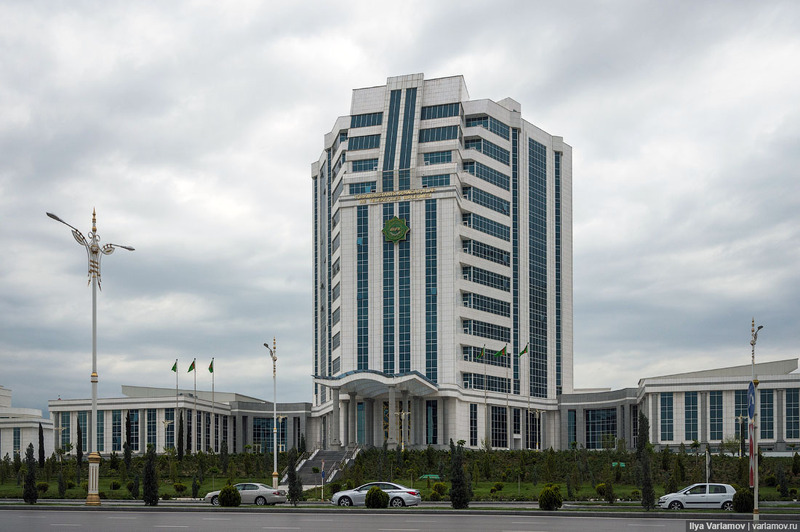 The house of the “Turkmenbashi” bank. 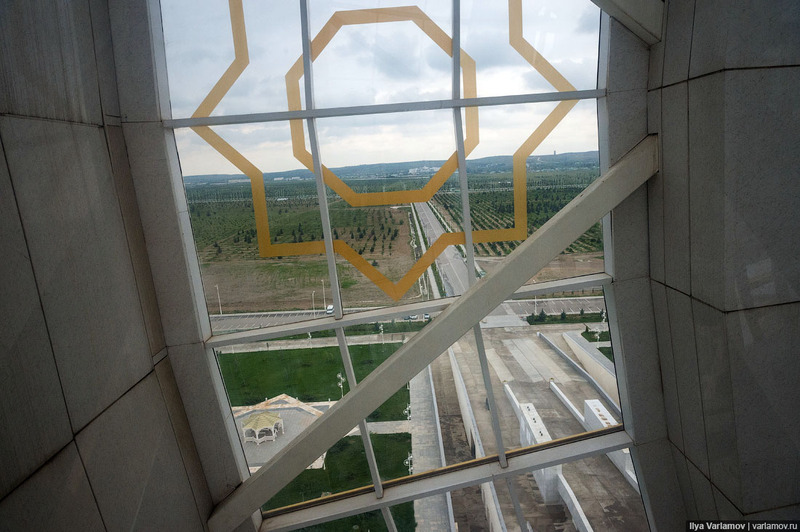 The layout for Ashgabat closely resembles the fantasies of Stalin’s architects. 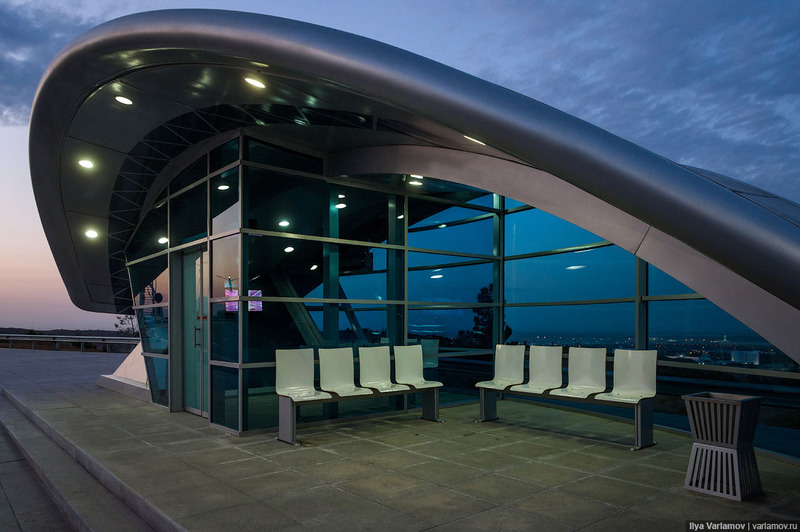 The next type of local landmark is the bus stop: each one is unique. 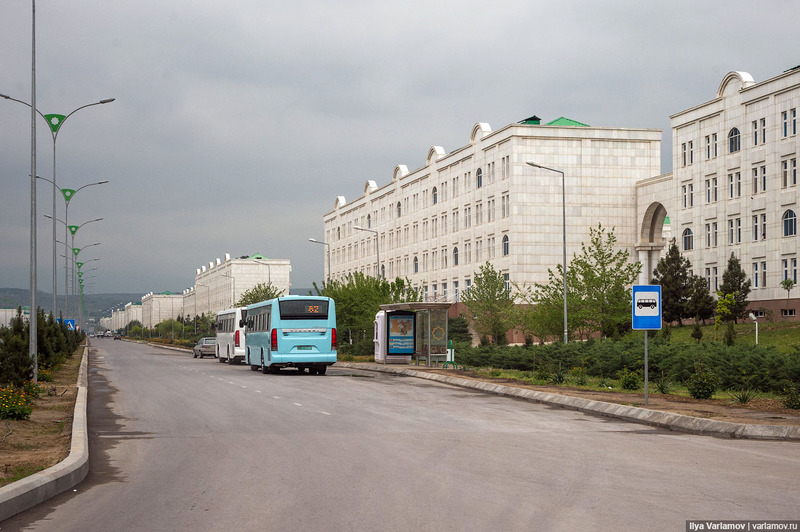 Since the summers are hot in Ashgabat, the main bus stops have closed areas with air-conditioning. 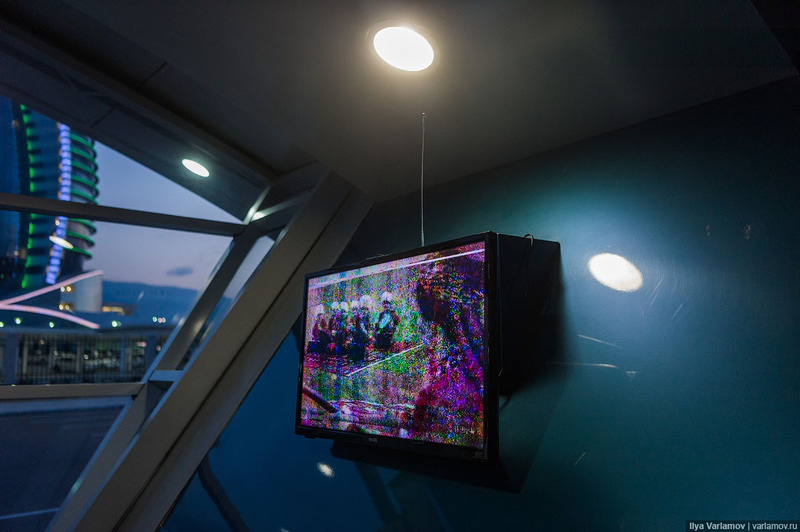 There is always a television set working inside. 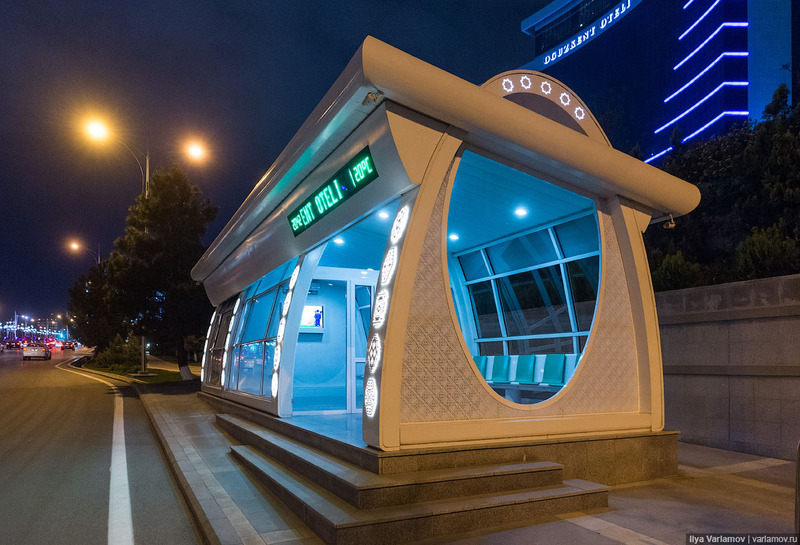 A bus stop with a kiosk. Air conditioner and television inside. 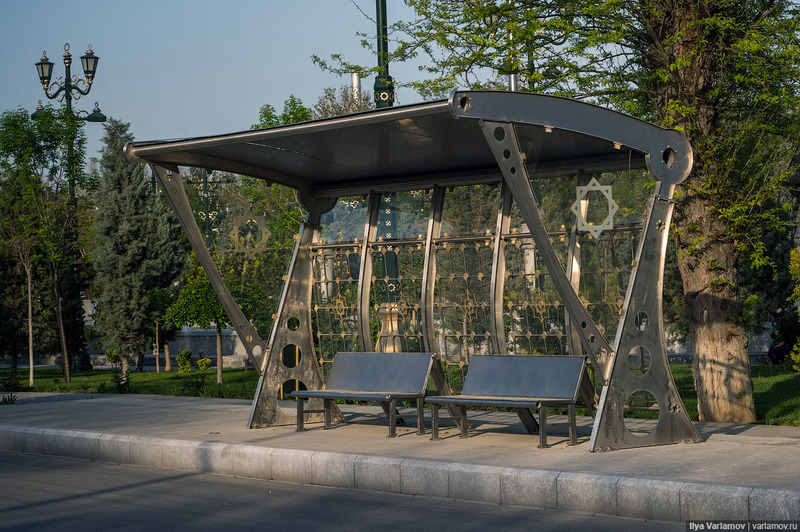 This simple bus stop is actually not so simple. 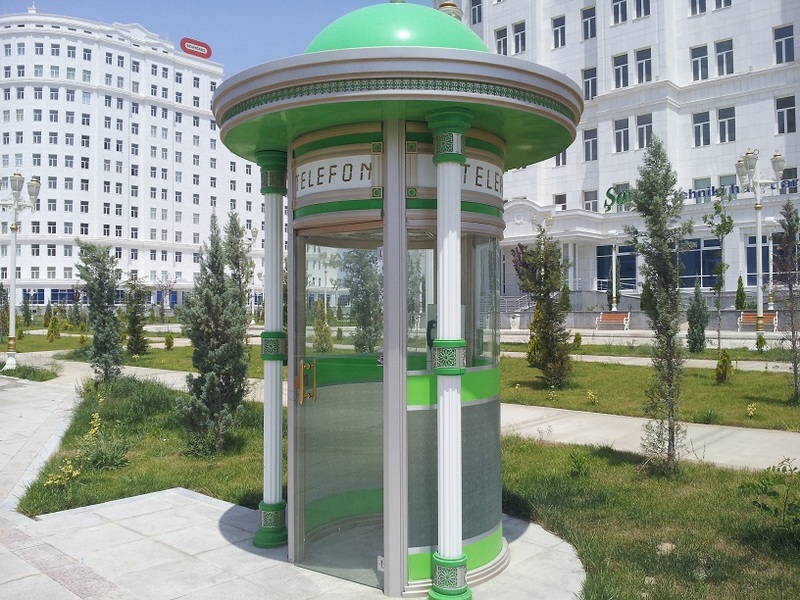 The crucial thing that all Turkmen bus stops lack is information. There isn’t a single map of bus routes anywhere, and there isn’t any information on which buses stop here. I guess they put the cart before the horse. 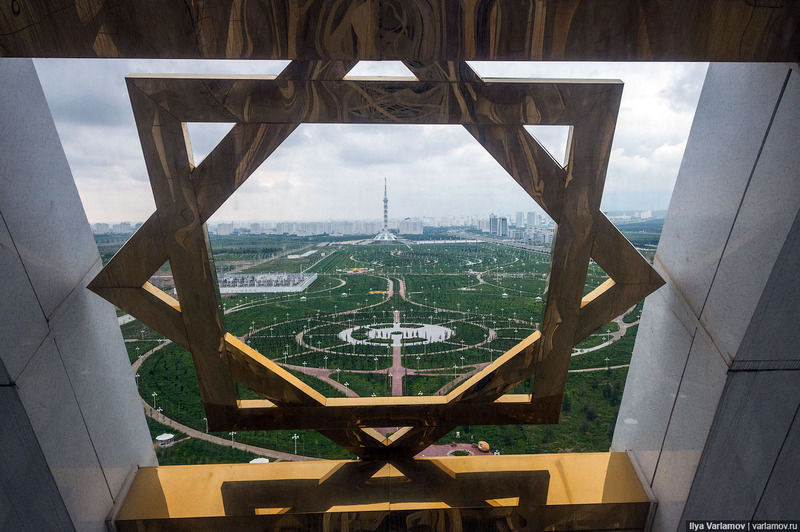 A decoration of the city: octagonal stars everywhere. 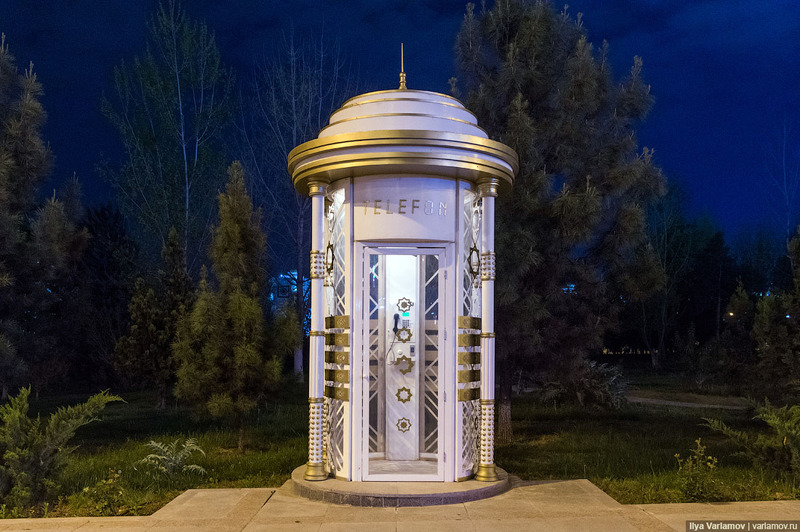 ...or a telephone booth. Everything must seem rich and expensive. There is only one criteria: it should look like nowhere else. Common sense does not apply here. 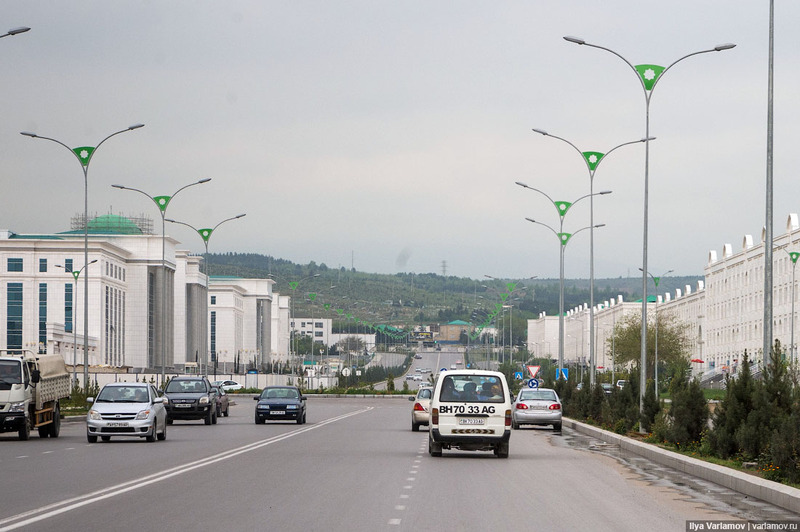 If told to, Turkmens would start decorating the road curbs. 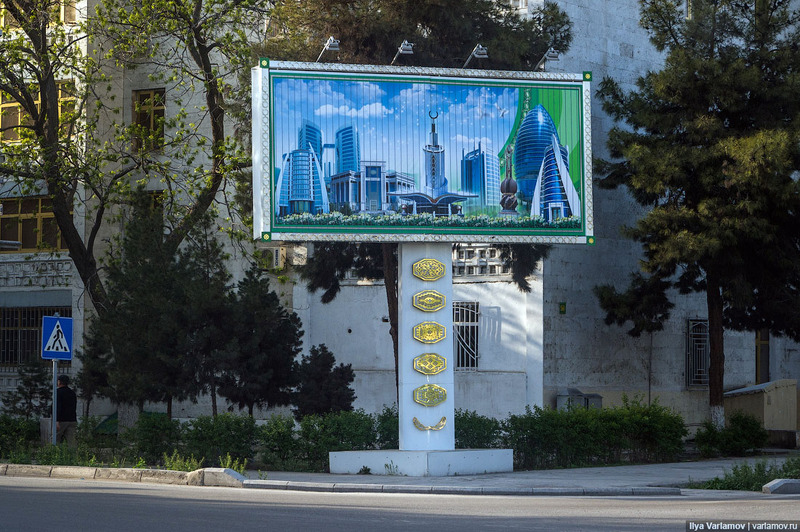 Note the fancy decoration of a common billboard in the center of Ashgabat. Here’s an ugly bench and a trash can. But still gilded! It’s not possible to make a simple street sign; everything must look like from a fairytale. 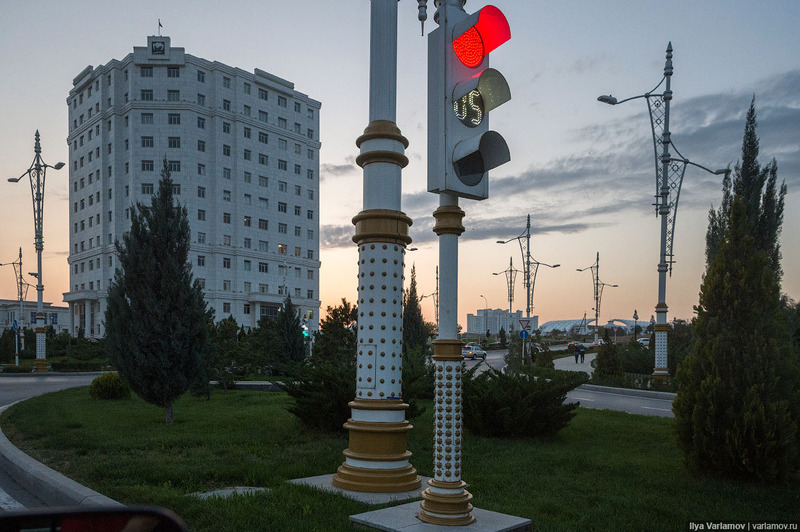 Ashgabat can also be proud of it’s most unusual street lamps. Firstly, they differ from street to street; secondly, there are no lights more intricate anywhere in the world. Each pole is a work of art. 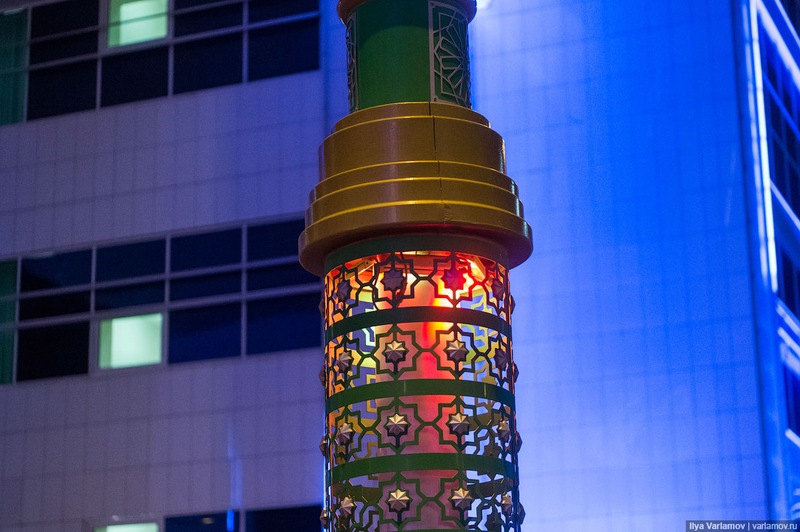 They are all different with decorative lights and other adornments. I can’t say that the result is particularly beautiful, but at least it’s interesting. Just some detail on one of the poles. 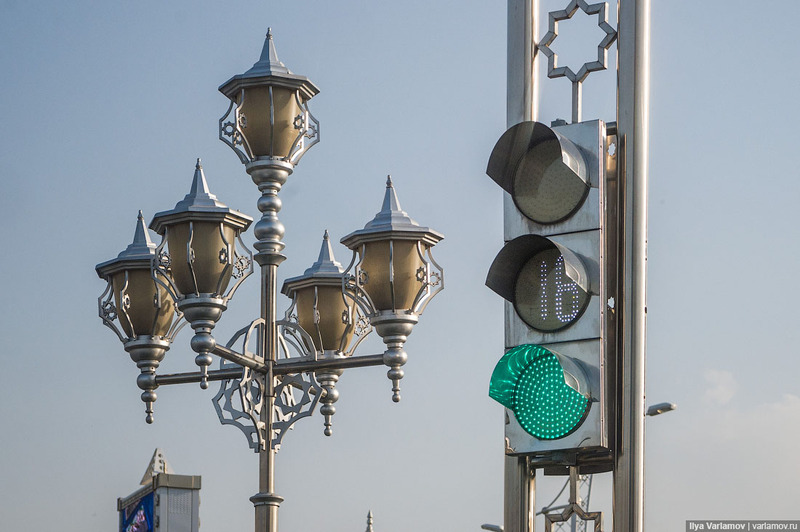 All traffic lights are covered in chrome and embellishments. Check out these poles: nothing here is simple. 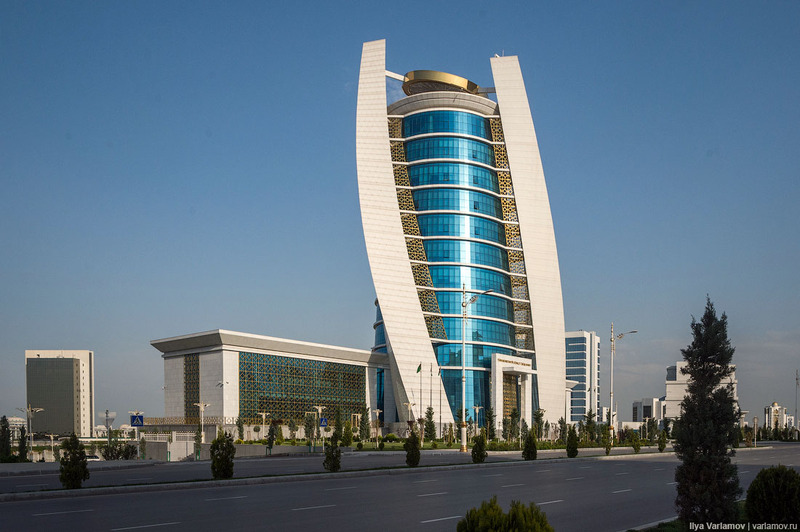 Each city’s detail must attest to Turkmenistan’s prosperity. 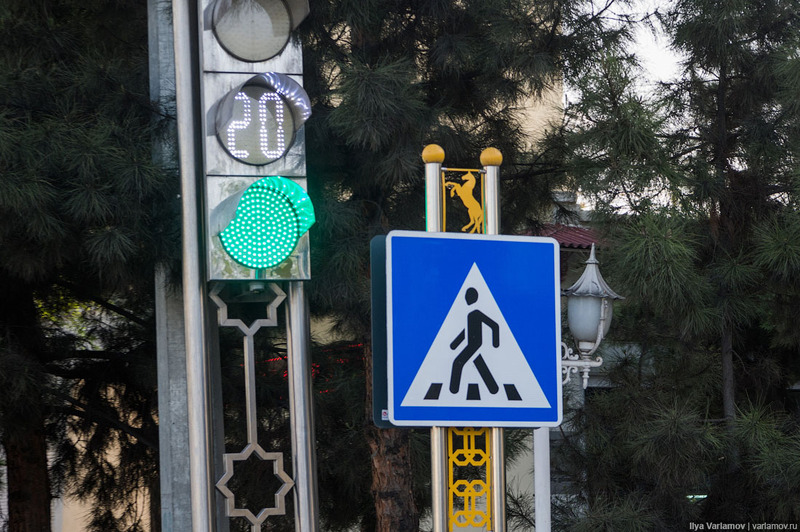 Here’s the decor of a crossing sign. 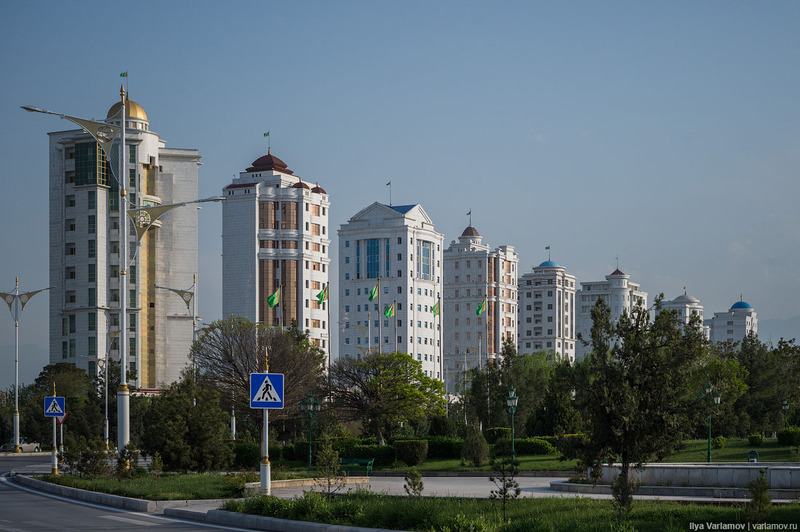 Huge blocks of low-rise buildings are shooting up like mushrooms on the outskirts of Ashgabat. 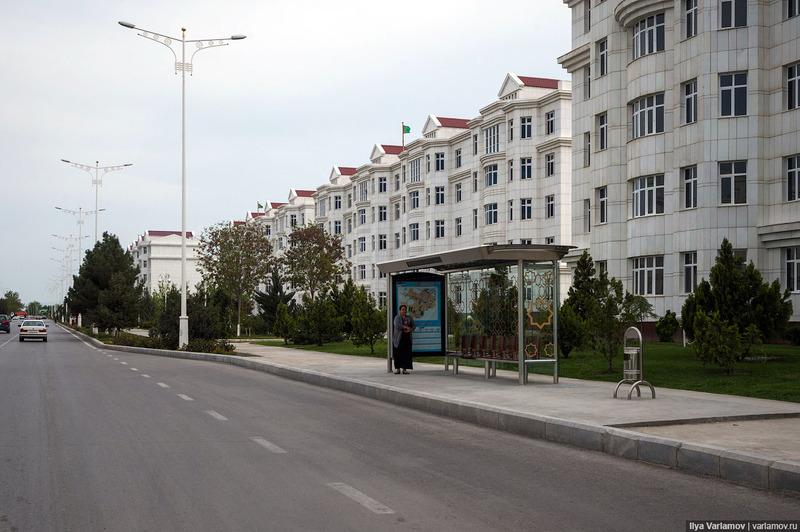 This housing is constructed for those whose homes are demolished in the center. Apartments are given for free. The district is considered to be nice enough, despite the fact it is at a distance from everywhere. 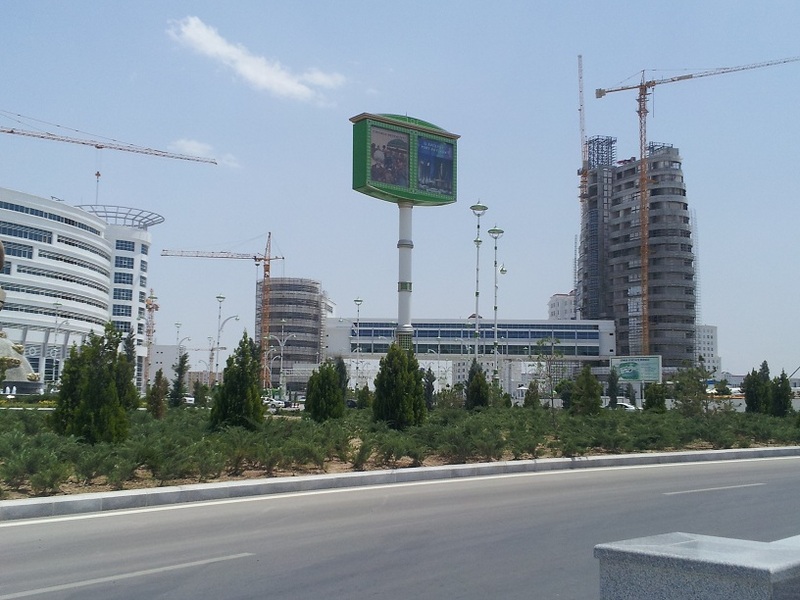 The quality of housing is good, rooms are larger, and Ashgabat center can be reached iby bus n 15 minutes. 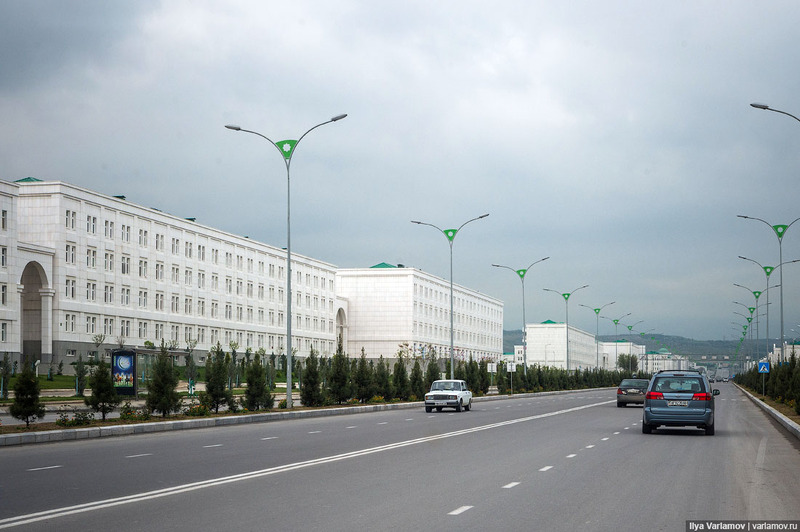 The district is very controversial, like everything made in Turkmenistan. On one hand, the housing is really high-quality. 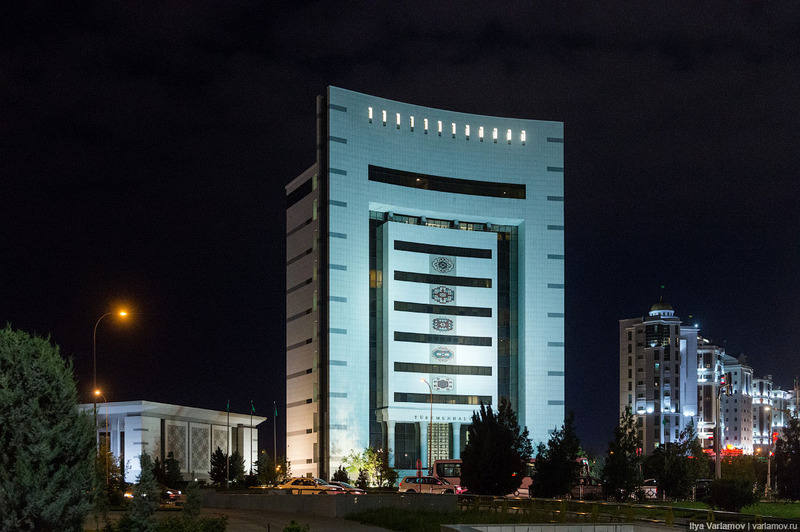 Turkmens use expensive, quality materials, all the buildings are white marble clad, and all the apartments are sold finished. 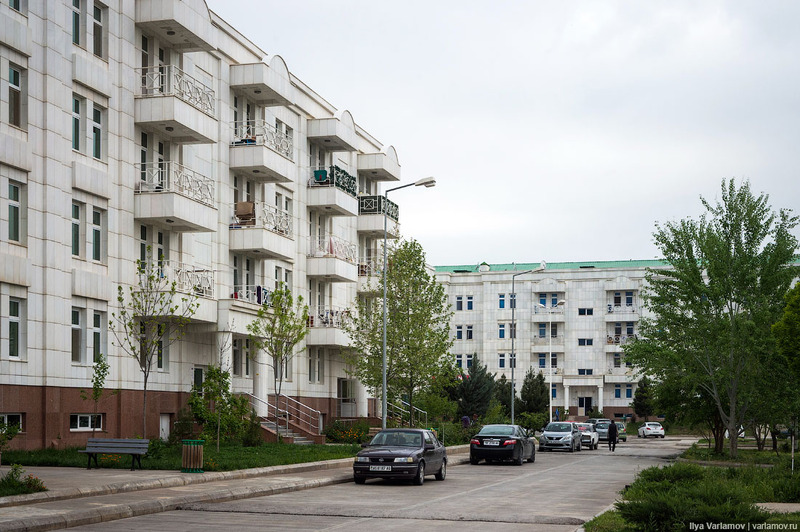 Nowhere in Russia can you find housing like this for internally displaced persons. In Russia, people are usually crammed into trashy panel rookery. I heartily support all low-rise houses with 4, sometimes 5 floors – it’s much better than a crazy 30-storey panel rookery. I feel 6-8 floors are enough in a city. On the other hand, the housing is built based on outdated standards of the 60s. 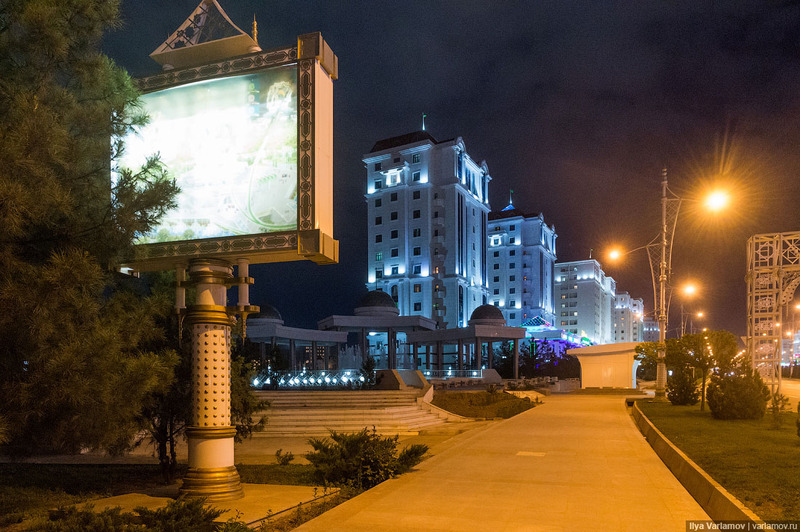 All these districts, yards, boulevards – they seem to have come from Soviet postcards. Europe, America and Russia have already got through it, and we all know what such yards can turn into in a few years. 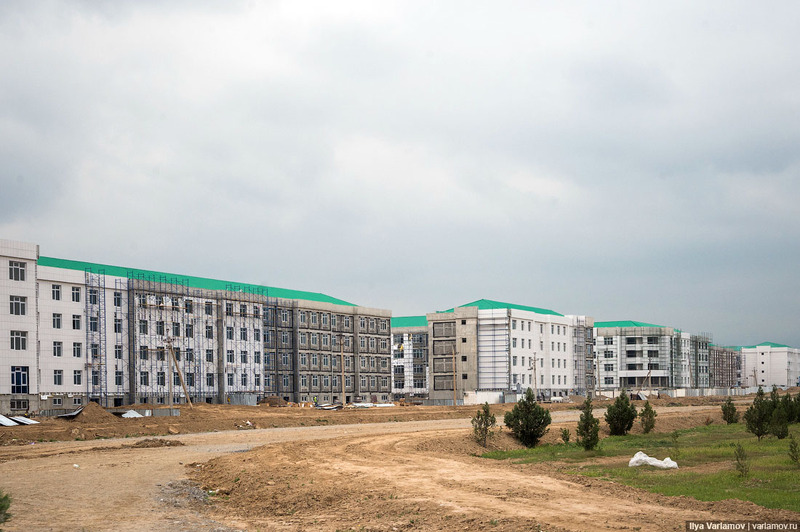 Taking into account how much Turkmens spend on construction of these districts, they could have built far better housing. It could be comfortable, modern, and people-oriented. But it’s not. Well, construction is well under way. 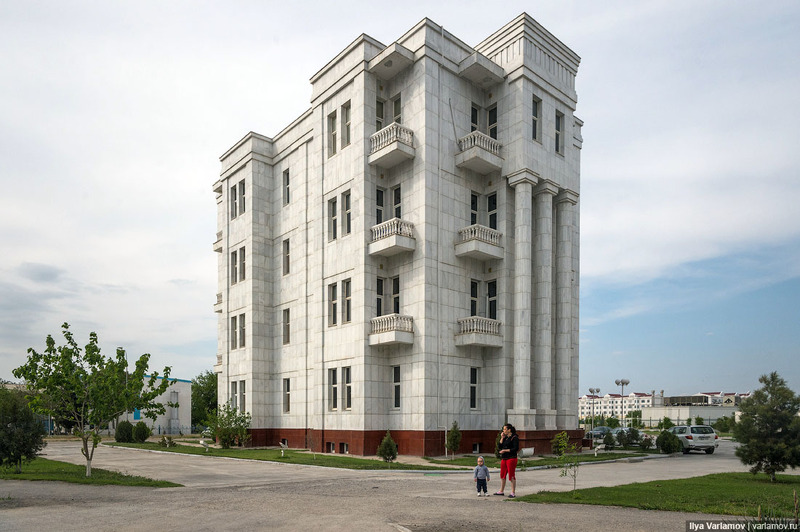 Buildings are solid and all of them are coated with marble. Looks sumptuous. The first thing that troubles here is wide boulevards in a residential district. 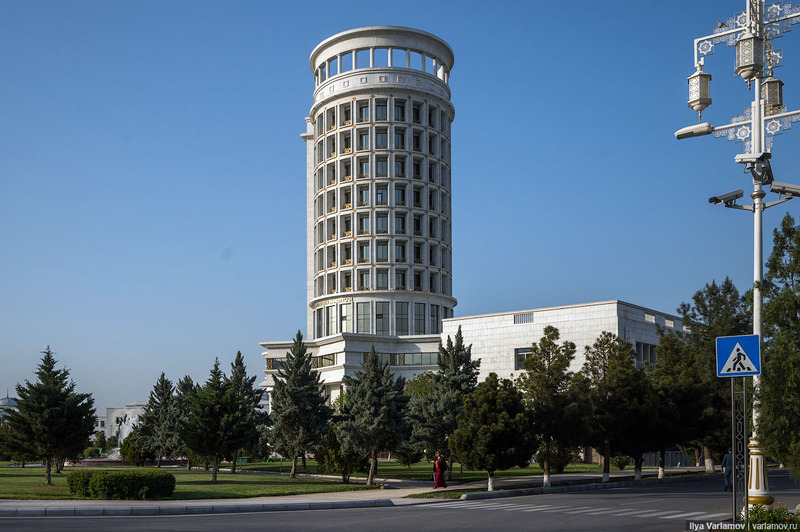 This is a typical image from Soviet architecture guidelines. 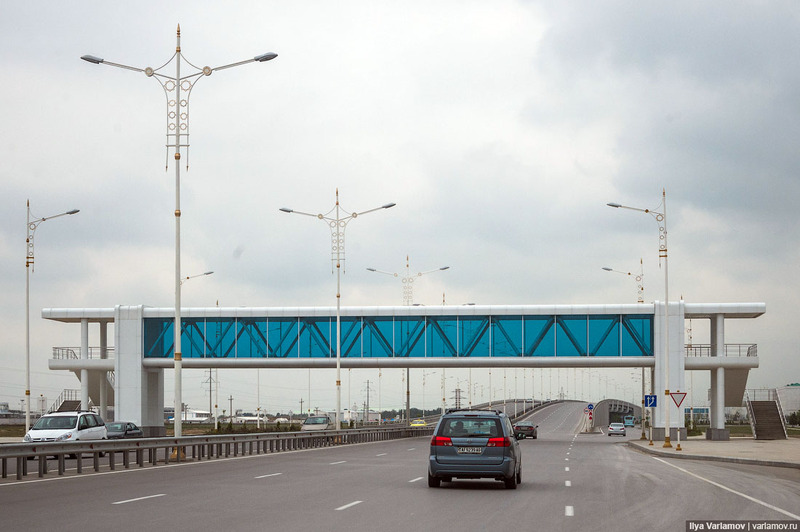 Let’s construct highways and of course pedestrian underpasses. Why is this bad? Firstly, the highway makes a lot of noise and exibits other harmful car effects. The wider the roads – the more cars, the less comfort for people. This street is harder to cross; the link between the two sides of the district is broken. People stop going to the other side of the street because it demands too much time and effort. Nowadays, the world’s best practice doesn’t accept wide roads as a part of residential city environment. Cities do need highways; however, they should be isolated and shouldn’t cut a residential district into pieces like a cake. Here you can see how all this stuff looks from above. Note, that even in a newly built district there are too many wastelands. All these wide boulevards and large lawns near every house will always be empty. Not only is it too expensive to take care of these pieces of empty space, but these enormous lawns also resemble Silent Hill. I have already shown some of them here before. Given that all the buildings are 4-storey still, not very many people would live here even if they were fully occupied. People don’t like large empty spaces, they wish to get out of here as soon as possible. This is how it looks from sea-level. 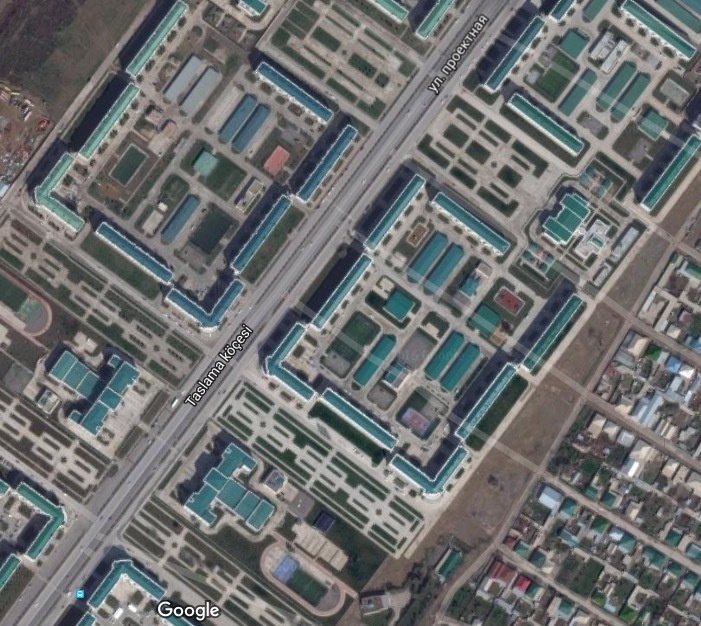 You can see a very low density of housing and enormous empty spaces. Really awful. 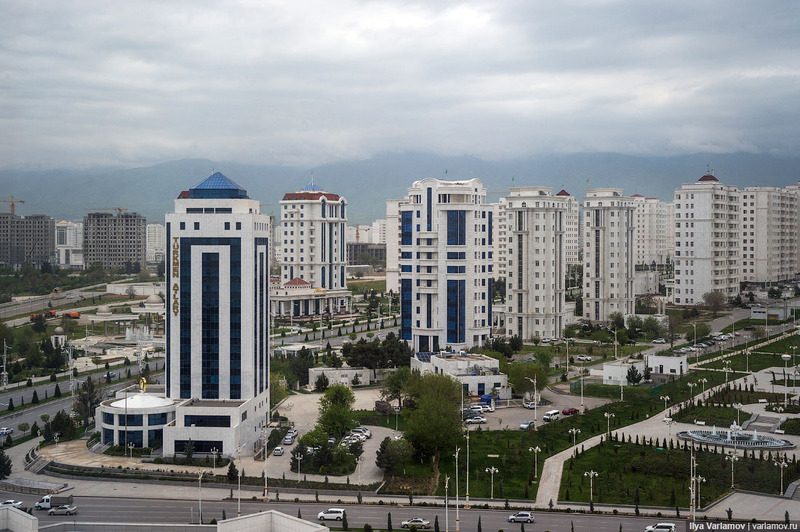 Besides, Turkmens continue repeating Soviet town building mistakes and split city districts into business and residential. Try to recall cities and districts where you feel comfortable. Developed countries changed their mind about this idea a long time ago. Such type of city planning results in many negative consequences. First of all, it causes internal migration between types of districts and ghetto. Second of all, it is impossible to do business successfully in these districts, because there are no people around. Therefore, streets will always be dead, and neither cafes nor stores will be opened there. Thirdly, it is not safe in these dead districts. That’s why in a well-planned city, buildings should be mixed-use. All infrastructure should be within walking distance. 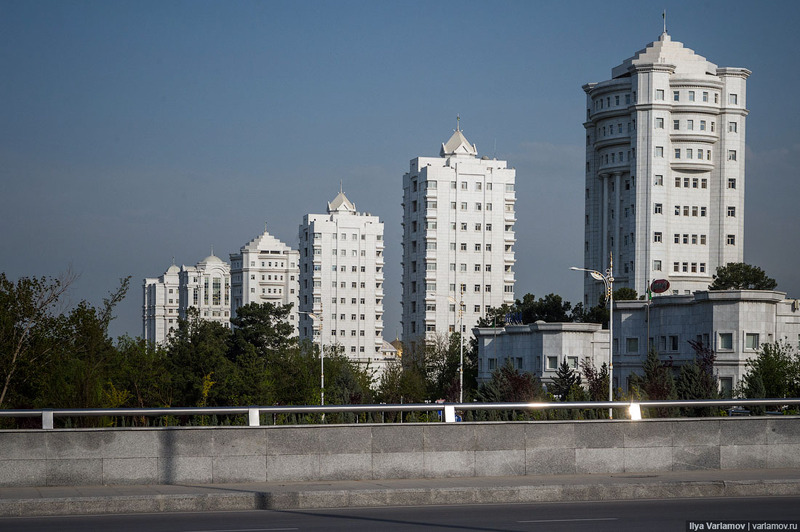 It doesn’t make sense to build kilometers of apartment buildings. We don't have to look very far for examples. 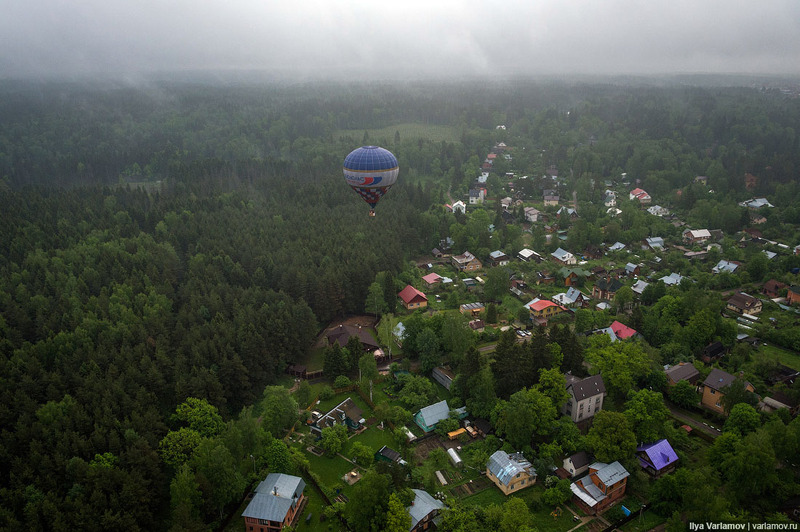 Just look at the historic center of any European city like Moscow, for example. You will see both an office, and a house, followed by a grocery store, a cafe and a restaurant. 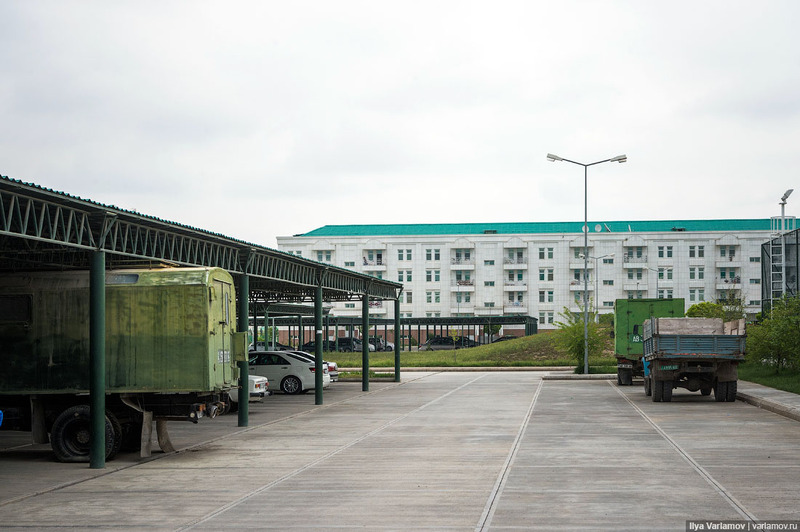 In Russia as well as in Turkmenistan, city planners do not to care about all that and just scatter uniform houses in uniform districts. It’s easier and faster. There will be loads of problems later; but further generations will have to deal. 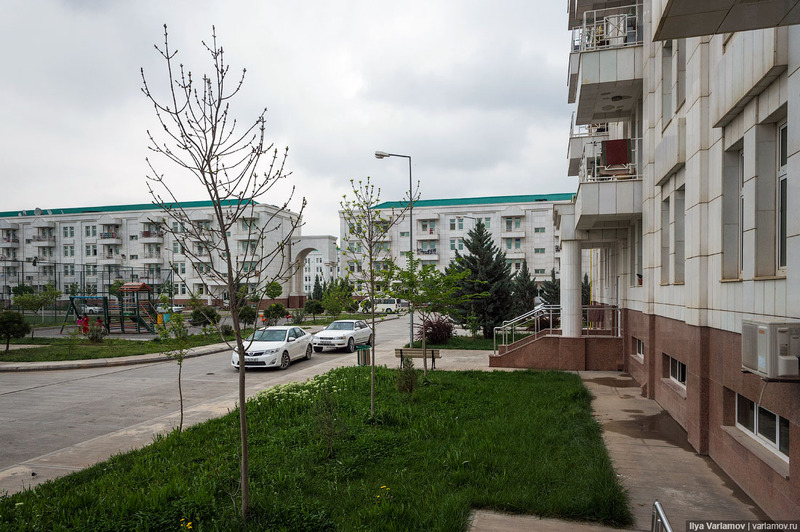 Another problem typical for almost all new Turkmen apartment buildings are large socles... What for?! Remember, if you want to enter on the first floor, there should be no ladders on your way. 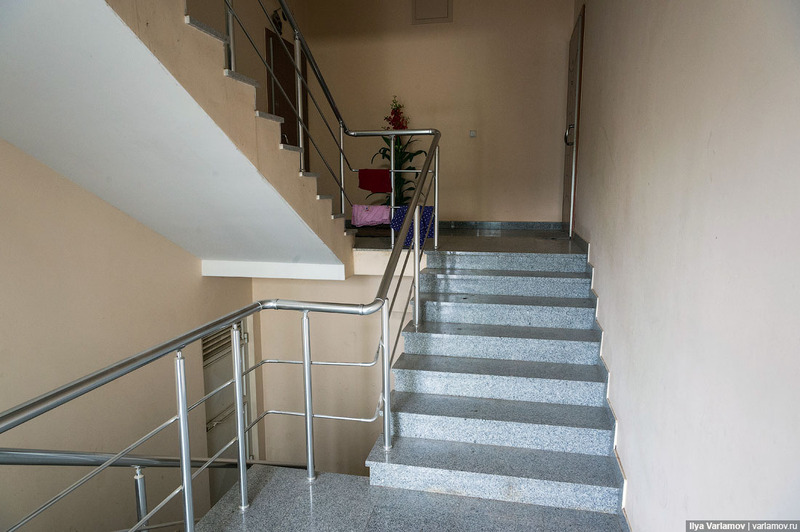 The first floor should be at a ground-level. 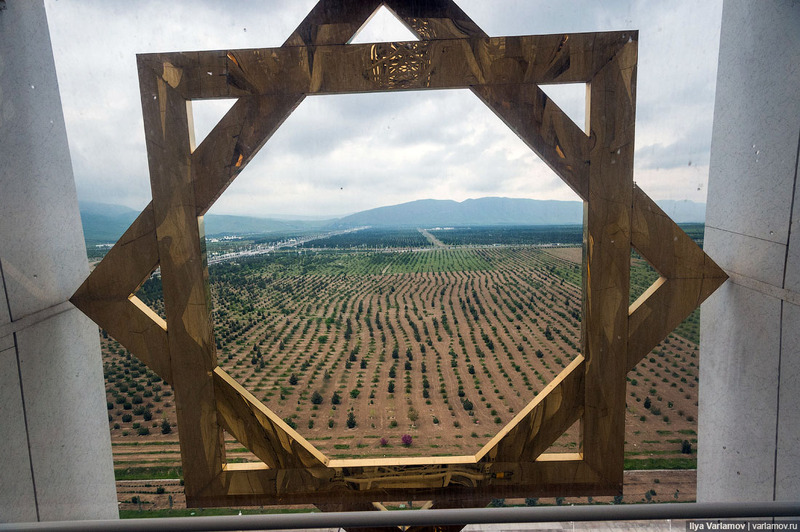 But Turkmens are so fond of ladders that sometimes they build a socle several meters high, like on this photo. It’s particularly weird because the ground is flat here. Why is this bad? Once again we get an empty street as a result. Walking down the street, you see nothing happening on the first floor. It makes it difficult for people because they have to go up and down every single time. Moreover, it becomes an insurmountable barrier for many of them. Indeed, you will not run into a grocery store here, you won’t even notice it. All buildings here have high socles. The next problem is that the first floor is inhabited. Together with previous mistakes described above it complicates the situation even more. As a result the city looks totally dead. The street should be a social space. Facades should be used. 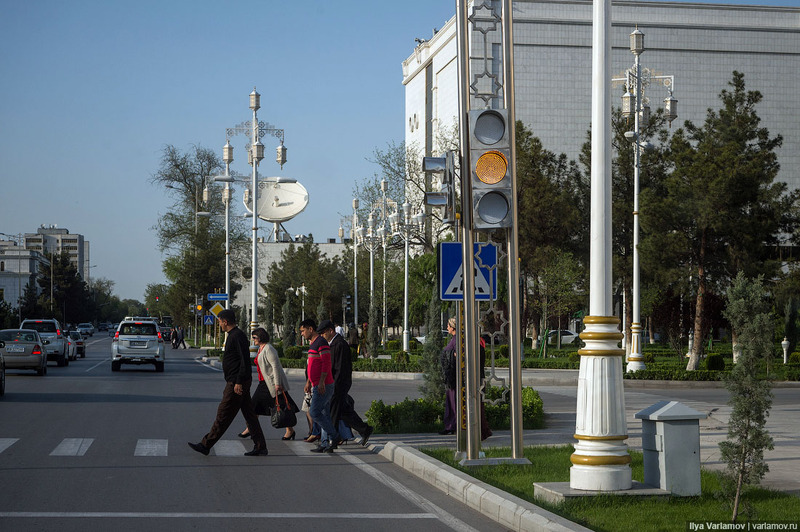 In Ashgabat, nobody wants to go for a walk. You only want to get from the point A to the point B and hide in your concretesanctuary . And yet everything looks expensive. 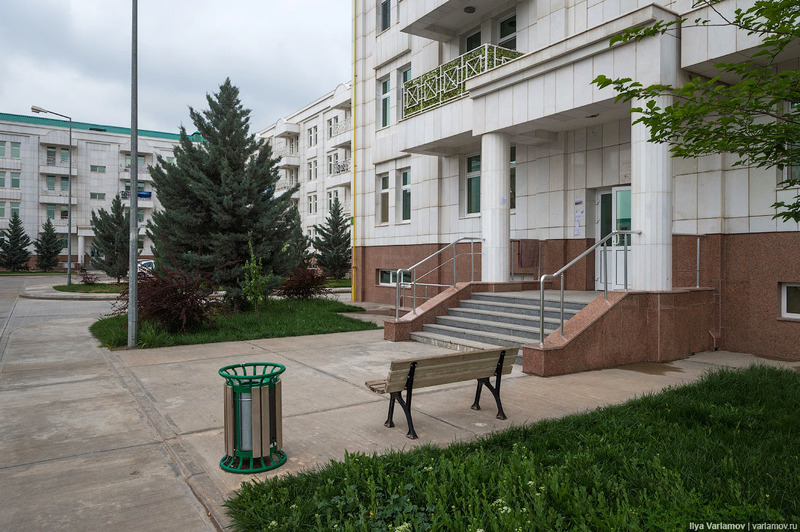 Everywhere you can see small lawns, all flowerbeds are equipped with auto-watering systems, and all the buildings are decorated with marble. 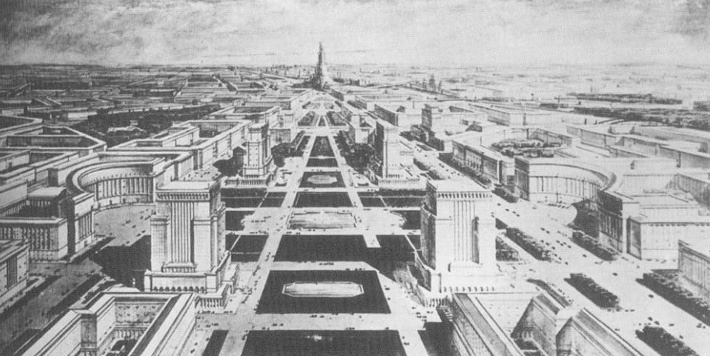 For the same amount of money you could have built wonderful districts even better than in Europe. 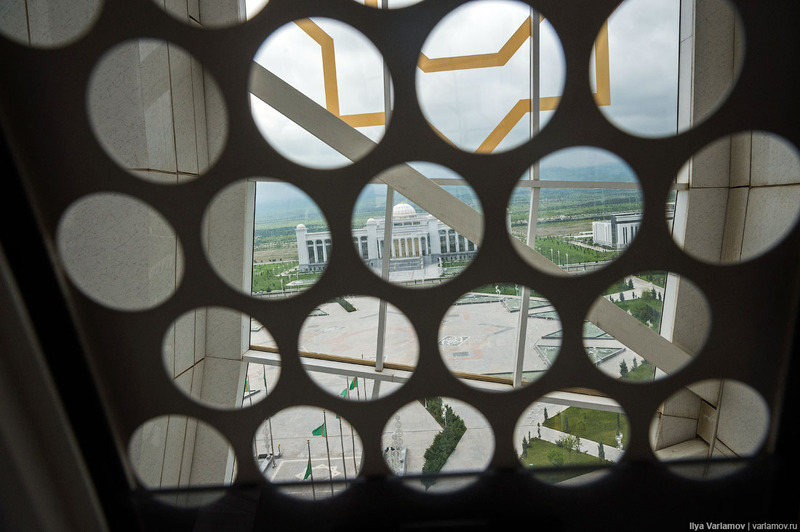 But unfortunately Ashgabat repeats the mistakes of the past. Why does this happen? I have no idea. Probably because they do not consult international experts, or the Leader’s son designs all these districts, and nobody can object. Anyway we get the dead city in the end. Situation in the courtyards is not better. Firstly, in the centre we have huge car parkings which take up almost every single piece of land. Such courtyards look a little creepy. They could have made awnings light and good-looking, but everywhere you look you see only these large ugly structures. Look at this satellite image. 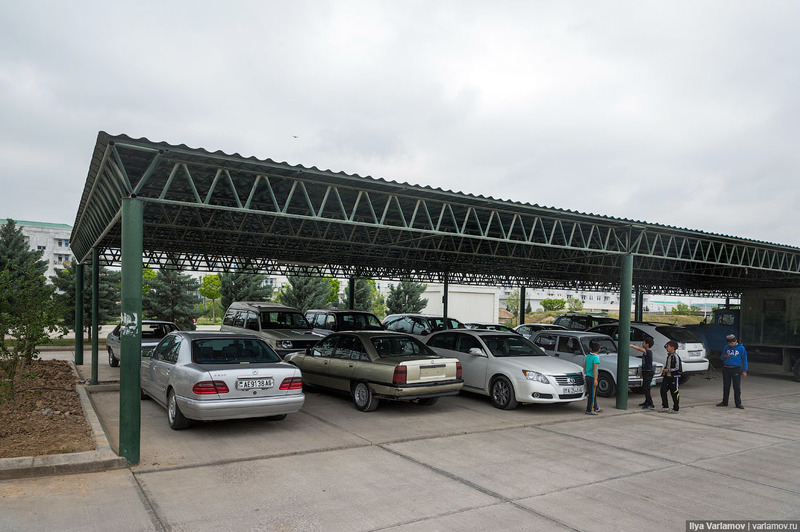 Do you see these green parking roofs? There is almost no space for anything else. Here you can see a lot of wastelands. It obviously wasn’t created for people. Playgrounds are pretty small and seem to be placed just for the record. Children have no desire to play here. Almost everything is concrete-made. Yes, they prefer concrete yards. During hot summers concrete surfaces don’t heat up as much and serve longer. In general, everything is planed based on Soviet guidelines. Why do they make these stupid socles? There are no elevators. Doors are not closed. Decorated with natural stones. The most popular advertisement is for carpet cleaning. That is it. 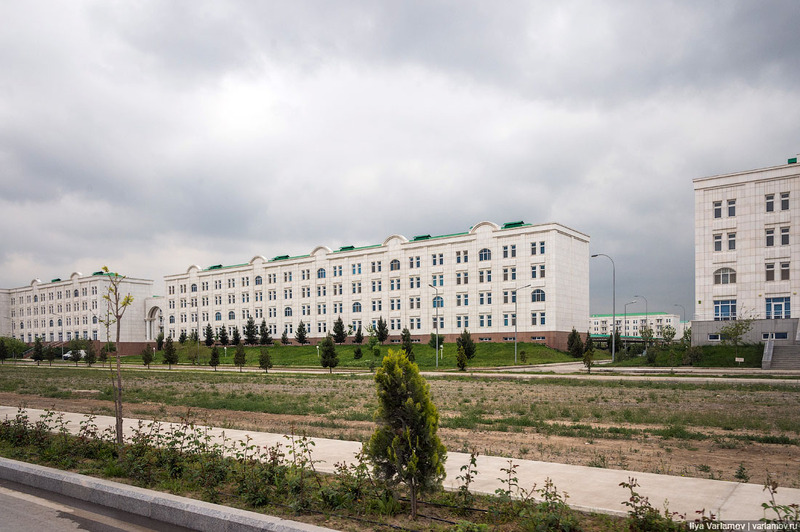 Such districts look better than the social housing in Russia. Moreover, I am sure many readers will really like it. But it’s a pity that with their huge financial capacity they repeat old-school architectural mistakes. I’m going to tell you something. 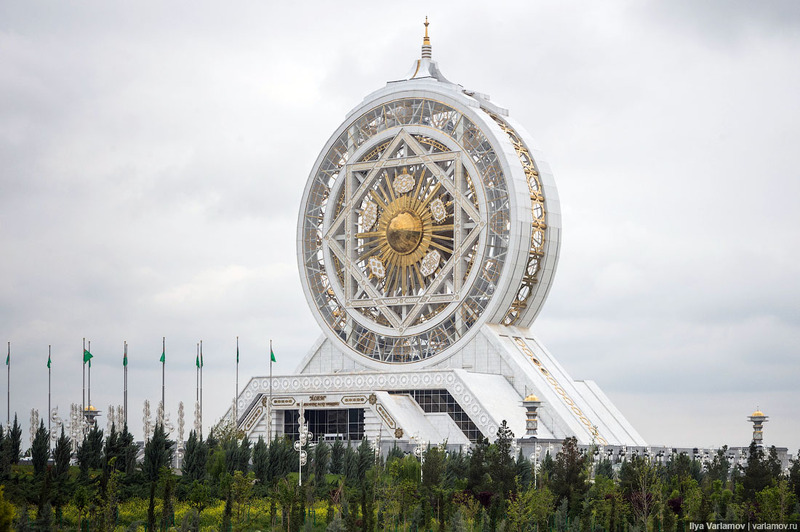 But don’t laugh... Turkmenistan can be proud not only of its wise governor the Great Berdymukhamedov but also of the biggest Ferris wheel! Now, Singapoor, London, and even Melbourn choked: “No way! We had the biggest ones, didn’t we? !” Actually, not. 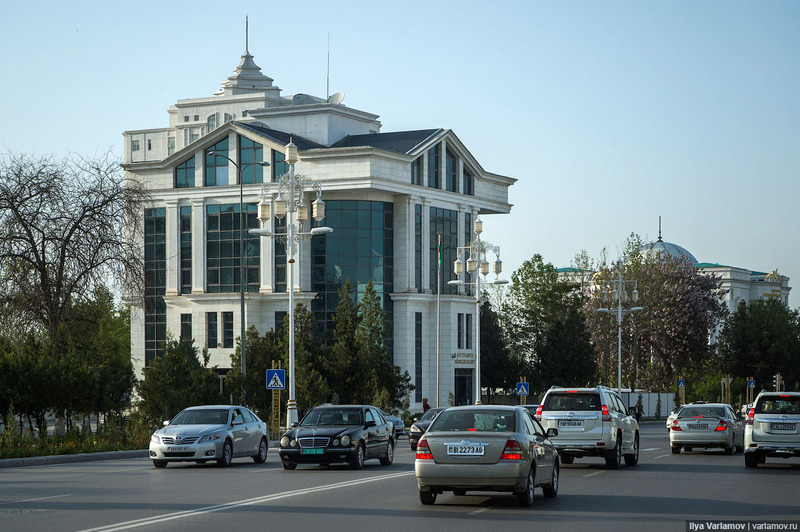 The biggest one is in Ashgabat yet with an insignificant remark... 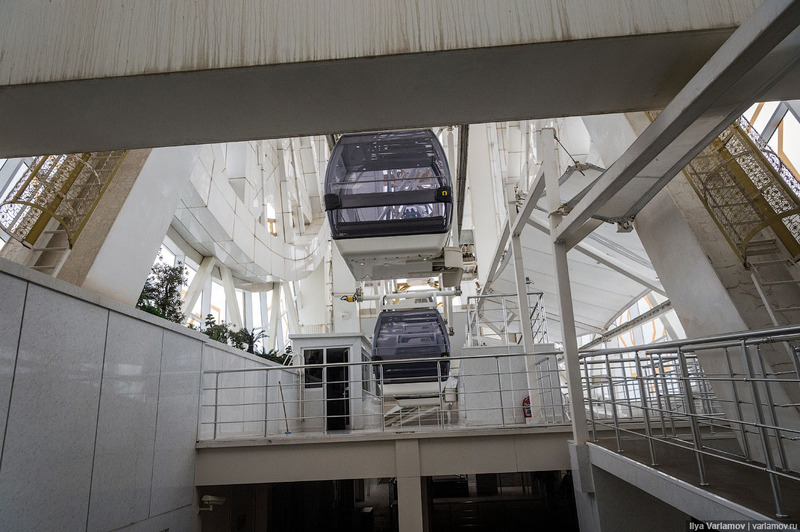 It is the biggest indoor Ferris wheel. 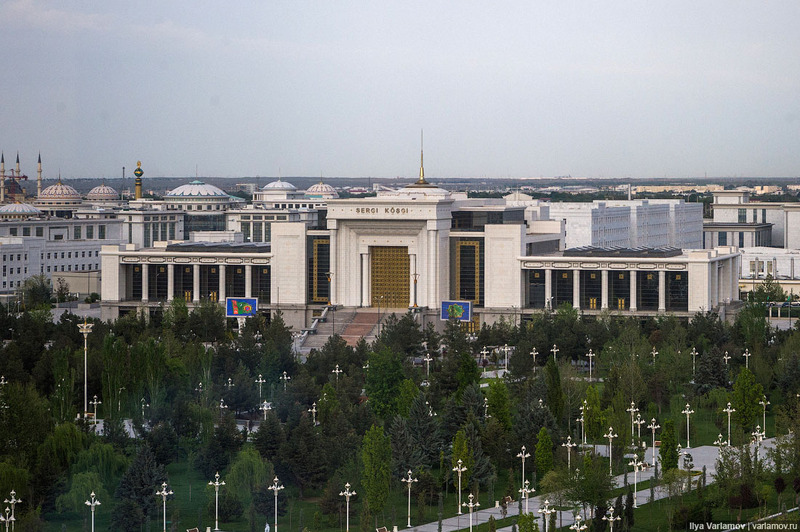 It was opened in Ashgabat in 2012. 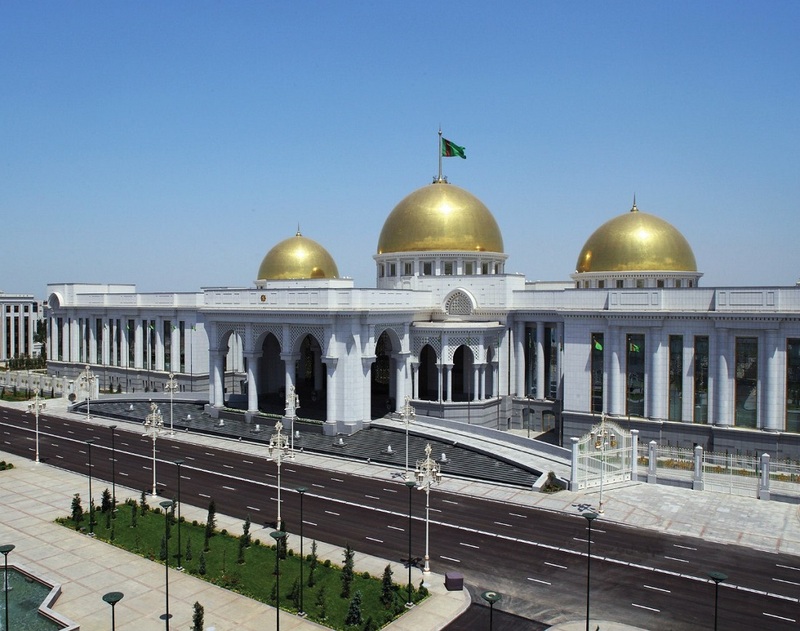 It is not called “indoor” because it has glazed cabins or is opened only for officials (it would be absolutely normal in Turkmenistan). 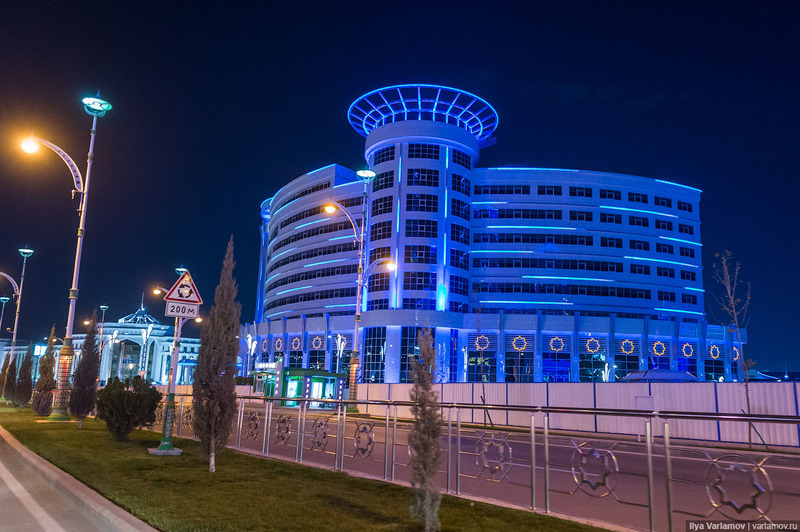 But because it is situated inside the building of “Alem” mall. 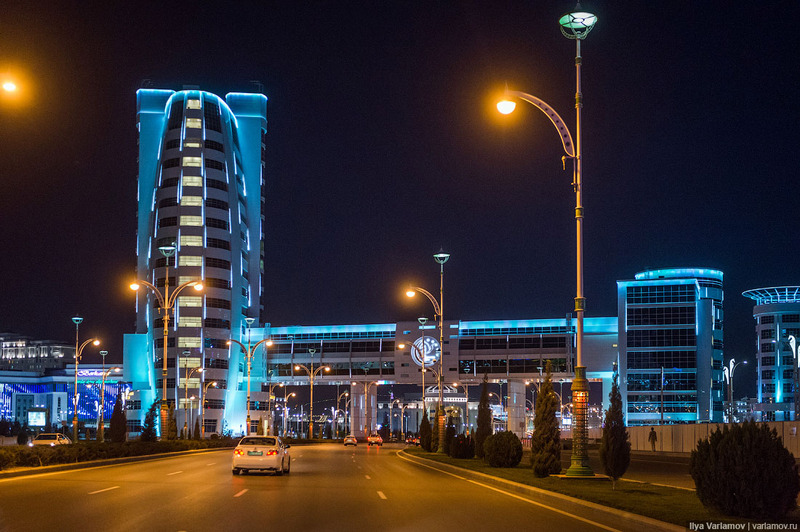 “Alem” (“Space”) was built by a Turkish company “Polymex” like almost all buildings at the tourist part of Ashgabat. 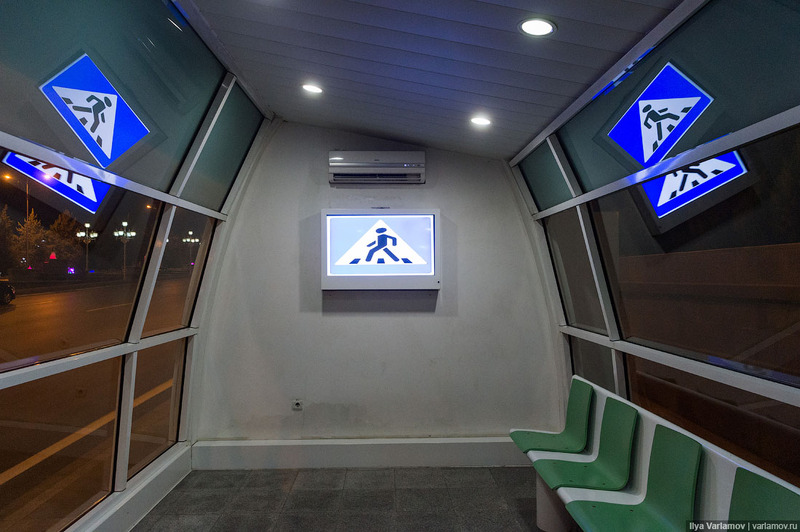 According to the project description, from the cabin of the Ferris wheel people can enjoy “a panoramic view of Ashgabat.” The height of the wheel is 55 meters, and it includes 24 six-seat cabins. 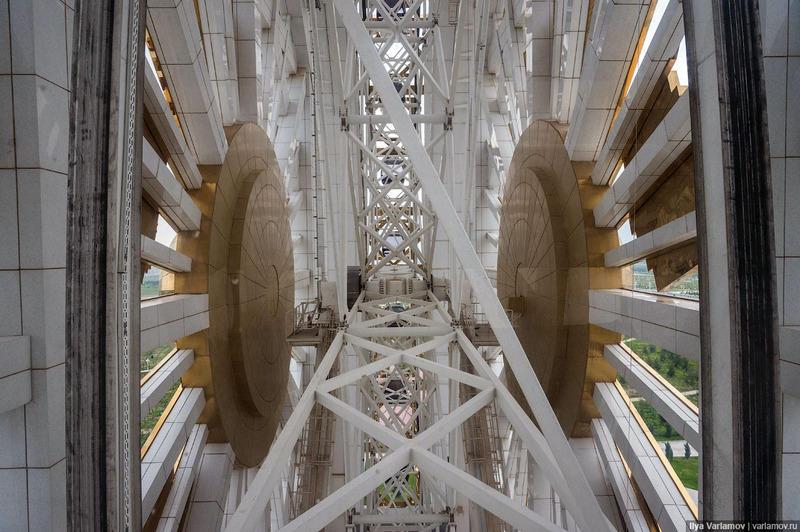 The wheel is completely covered with additional disc-shaped steel constructions with a diameter of 57 meters. If someone had told me this before, I would not have believed it. 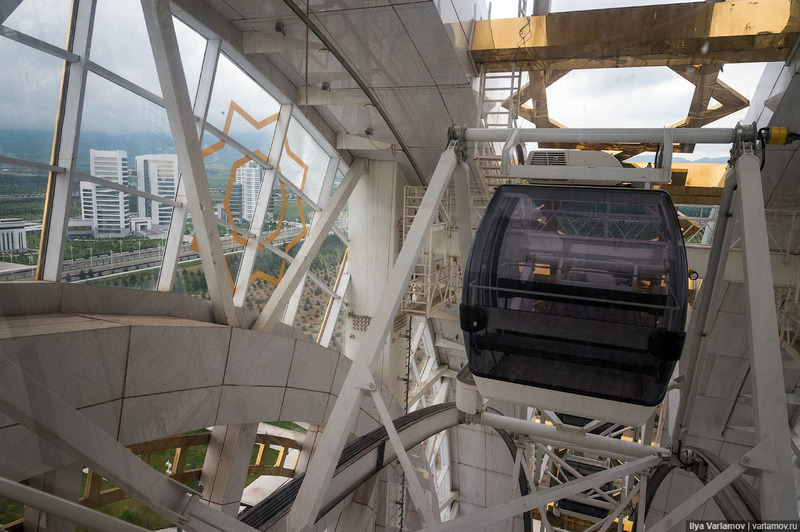 They have really stuffed the Ferris wheel into a cover to make it the biggest in the world. In other words, they were not happy with just an ordinary Ferris wheel. Inside it is just an ordinary Ferris wheel, but because of the dirty massive constructions all around you it feels like being inside a huge clock mechanism. This is the promised panoramic view. 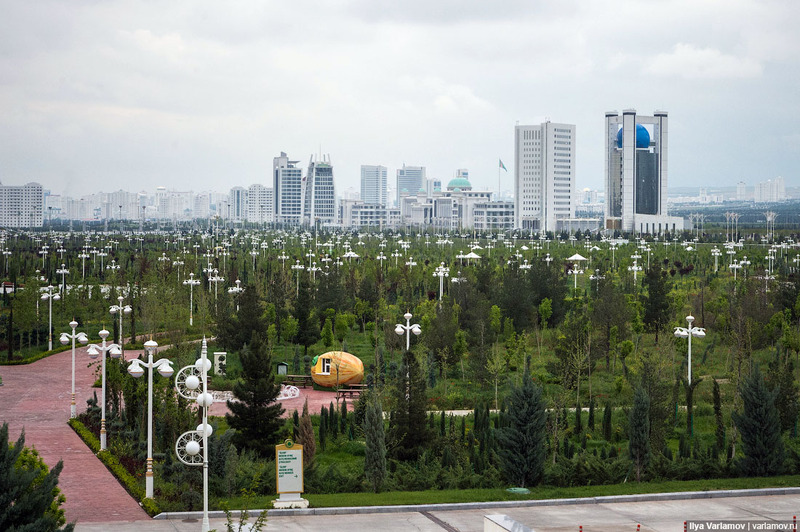 Breathtaking panorama of Ashgabat. The Ferris wheel is situated a long ways away for the centre, therefore you will not see anything from here. It is the weirdest crap ever constructed by anyone. I really don’t get how on earth they came up with an idea of an indoor Ferris wheel. 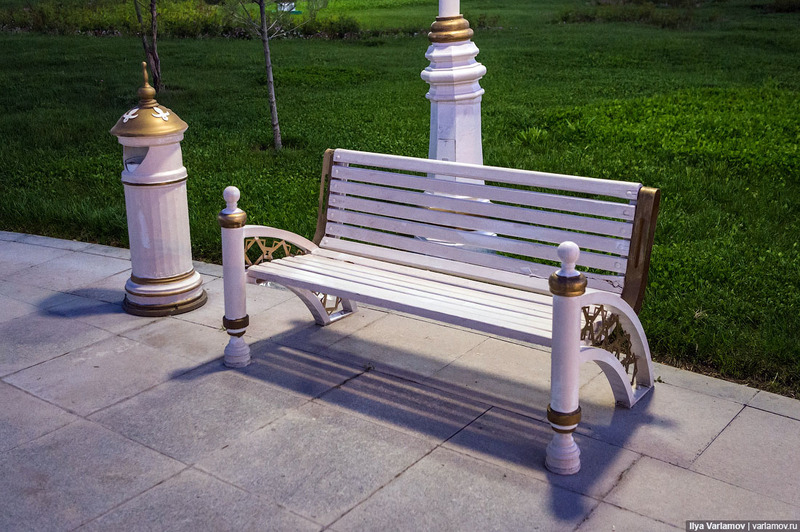 Enjoy the fantastic view of the park. 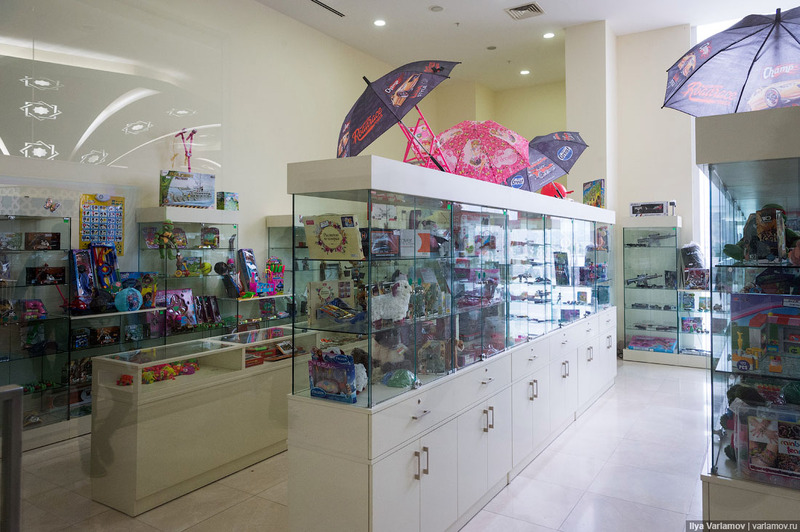 Children’s store for USSR fans. 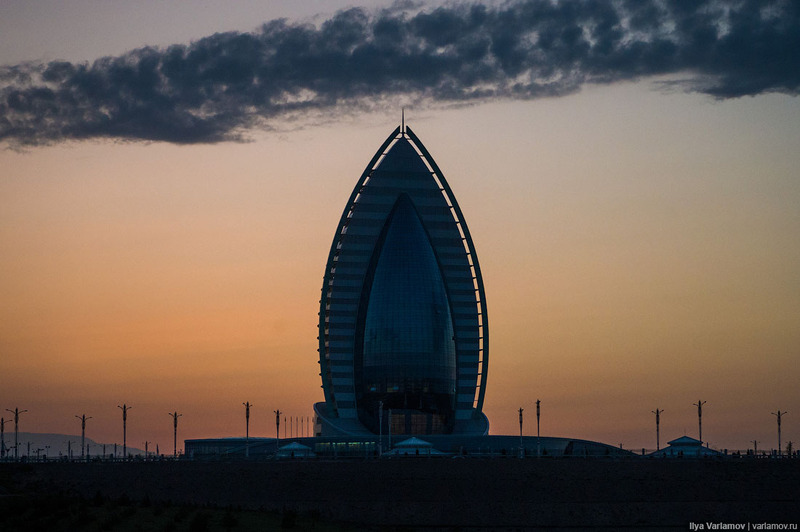 – The highest apartment building without doors and windows. давайте уже ссылочки на зарубежные СМИ, которые разместили у себя эти неказистые репортажики. хочу почитать как они все это распишут. что-то вроде: в холодной, суровой и тоталитарной россии, где повсеместно нарушаются права человека, живет один смелый и отважный юноша ilia voarlaamov, который как зеленая травинка произрастает в суровых краях, который не боится KGB и делает свои смелые и обличающие коррупционную систему новой россии. лол, одуван все еще ждет поток англоязычной аудитории? не знает уже как бабулета срубить. Тоже мне Бизьнесьмень. Я думаю сейчас самое время ввести платную подписку на блог. Державный пафос, постмодернистский китч, ремиксы на пышные постройки арабских шейхов с поправкой на бюджет – вот что отличает парадную архитектуру Туркменистана! 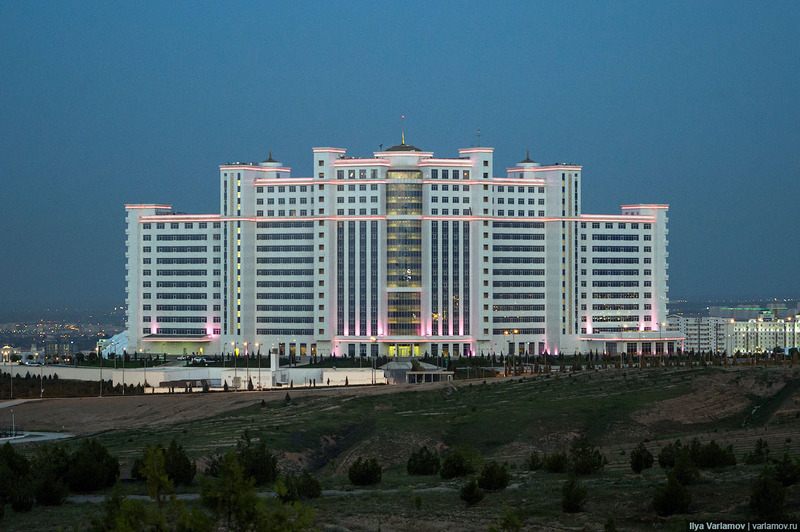 Граждане ВЕДУЩИЕ туркменские архитекторы, разве этой порнографии обучают в арх.школах? Уважаемому генералу блога тов. В-ву неплохо было бы проконсультироваться на предмет тенденций мировой архитектуры, прежде чем рекламировать в Европах её туркменскую разновидность. Долго и искренне будут смеяться над Востоком. И тыкать пальцем в СССР: вот чему научили младшую сестрёнку. От СССР, как и от России сегодняшней, сколько было толку, столько и осталось. 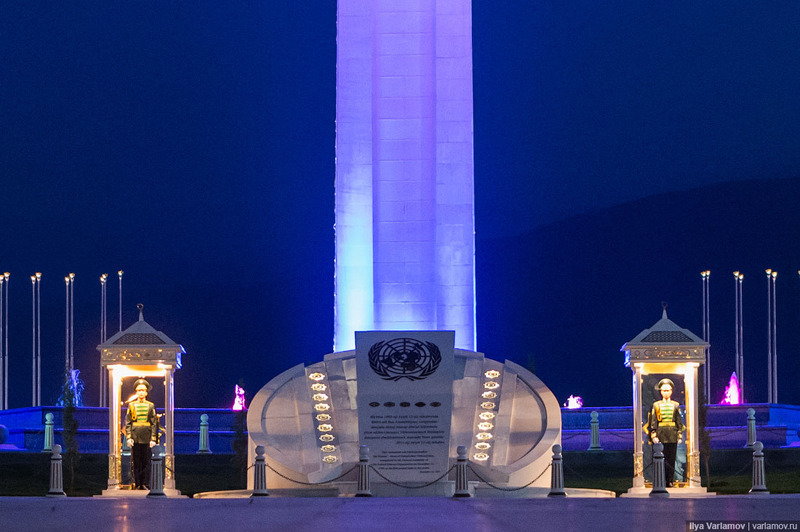 Как ни корми зебру комбикормом, скаковой лошадью она не станет! Больно уж рашкинская архитектура красива, одни бараки для холопов, да дворцы для царей. Та же азиатчина. Это из серии "сам дурак"? Так я про "замечательную" российскую архитектуру ничего и не говорил. Это вы сами (извините - чисто по-шулерски) вытащили контраргумент. О том и речь: нечего запад азиатчиной И РАШКОЙ (!!!) пугать в области архитектуры! Сначала надо научиться. 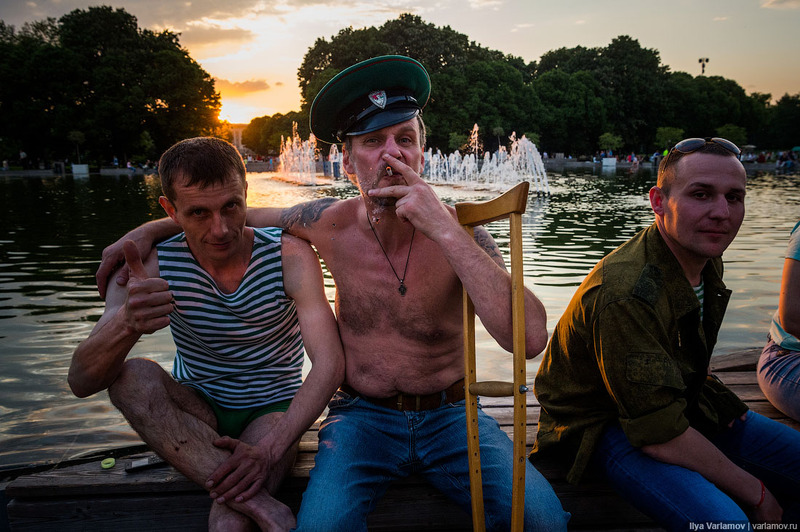 Потом строить. Потом уж хвастать. А дилетантам (без обид), или защитникам национальных ценностей (тут хвалю) следует хотя бы отличать передовое, нормальное и вынужденное (старые технологии) от бабушкиного хлама и откровенного китча. Как называется эта болезнь которая у тебя прогрессирует, ну когда в скобках больше чем нужно пишет человек? Создается ощущение что ты сам с собой беседу ведешь, уточняя в скобках, типа " че за хуйня блеять, а мож я ебанутый в край", или " ох ебать, а мож еще какую нибудь хуйню сморожу". Так и чувствую что ты ведешь такой внутренний монолог когда пишешь. Реал шизофазия у тебя на поздней стадии, дальше только дурка ёпта бля. Захотелось самовыразиться? Так найди стакан и выблюй всё туда. Потом выпей. Ах как сладко ты бомбишь. Ну не че, ты вроде норм поц, не буду как черт себя вести. Ваш вариант не совсем правильный. В английском в предложении должен быть глагол, у вас его нет. 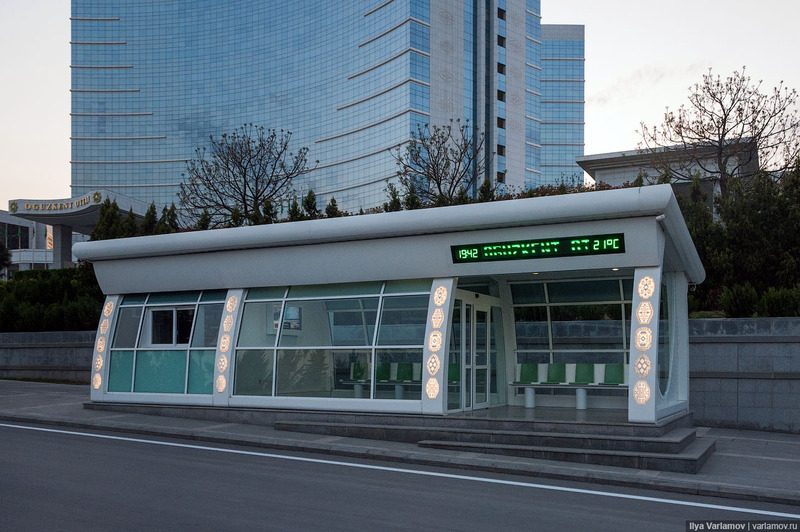 По сути, предложение говорит "all Turkmen bus stops lack information". 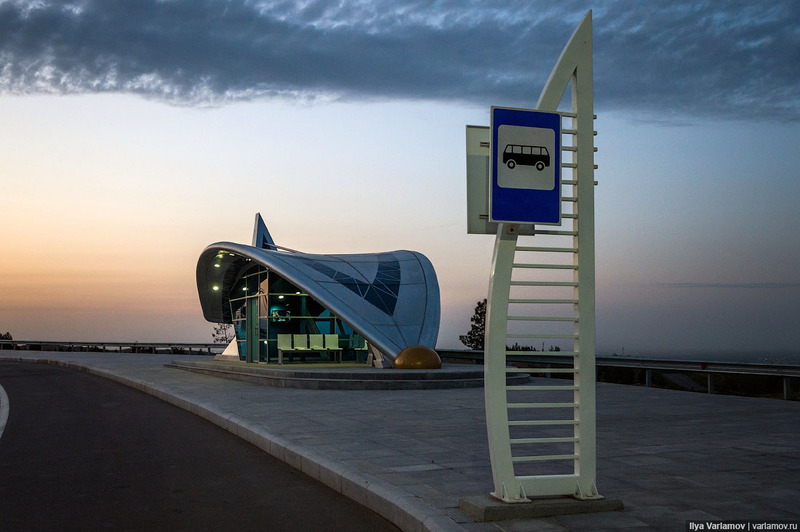 Вашу конструкцию можно использовать, если слегка переписать: "The crucial thing that all Turkmen bus stops have is a lack of information", но для американцев это звучит непривычно. Английская версия нах никому не нужна. Англоязычных не приобретешь, русскоязычных потеряешь. Парк с фонарями в виде крестов напоминает кладбище. Nearwill your of reguiders. You debt it do. 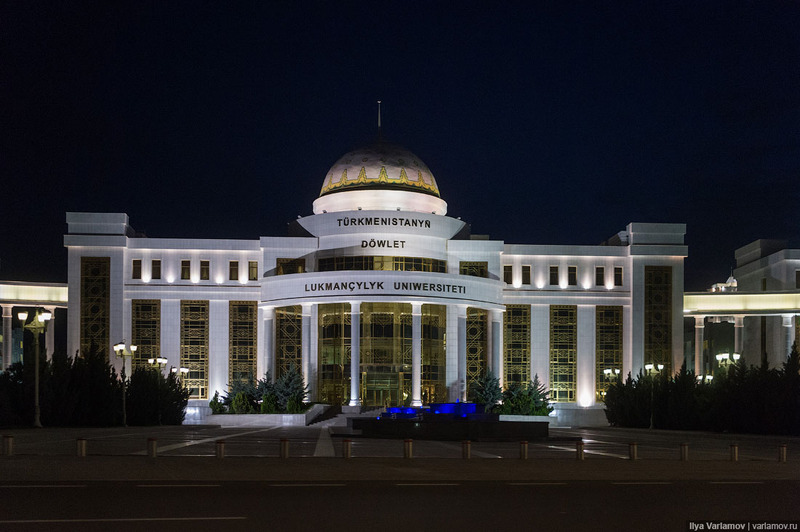 А на туркменском слабо? 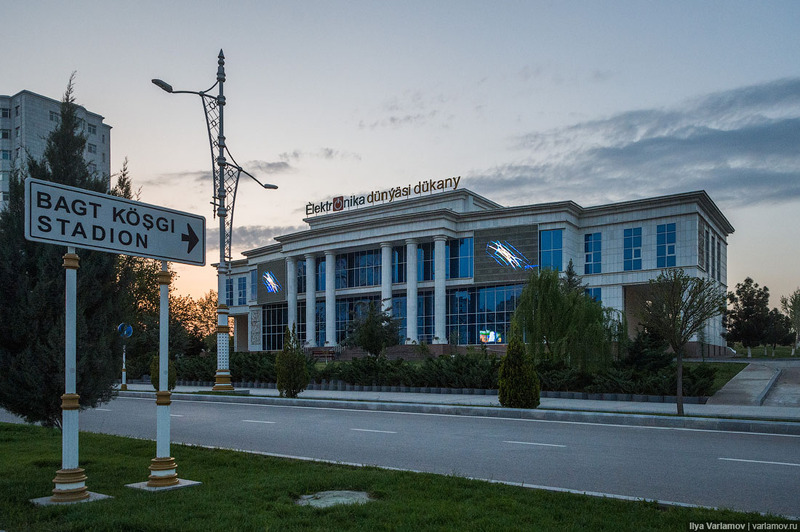 В крайнем случае на турецком. Турки заценили бы китч, это, типа мы сделали, ашхабад - это филиал нашей турецкой стройки. 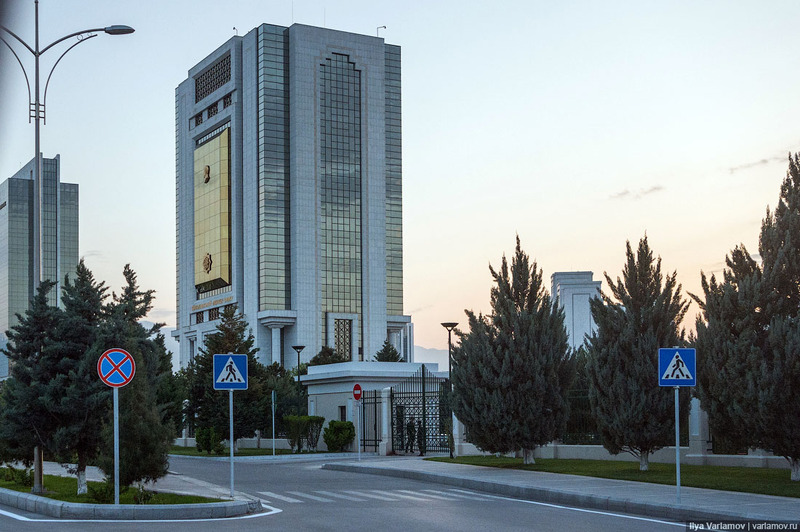 С турками в блогах поспорить за свои вывод слабо будет? Спасибо, классная идея переводить интересные статьи на английский язык, переслала друзьям.